I have discovered the use of trekking poles in my readings in the Internet about 5 years ago where it was used to aid older people in their walking and hiking on the road and on the trails. As we know, these trekking poles or first popularly known as ski poles which were always being seen in every event in the Winter Olympics and other skiing sports in temperate countries. Some writers would say that the origin of these trekking poles came from the European countries where trekkers, hikers, and trail runners (during the Summer Season and drier months) would use them for balance as well as to preserve their leg strengths for the long haul and also aid them in steep ascents and descents. For the past few years, almost in all the European Trail Running Events as well as Ultra Trail Running Events you would see almost all the participants carrying with them trekking poles during the race. I would have the impression that the routes of these events have very steep ascents and descents that one would need these trekking poles. When I first used these trekking poles on the paved road, I received some laughs and negative comments from cyclists who would pass me along the road to the point that they would ask me where is the SNOW and my SKI? But a few months after such incident, I would see Marshall Ullrich using these trekking poles on his successful USA Trans-Continental Run few years ago. If only these cyclists would see the video and read the book of this famous ultra runner, they would be convinced that trekking poles are also used in ultra running. Lately, I’ve seen that some of the Ultra Trail Running Events in the United States have already allowed the use of these trekking poles as compared when it was then a “no-no” for runners to use these poles. Some would say that one is having an undue advantage from the other runners who would not use these poles. Some would say that it is a form of cheating in ultra trail races. But whatever it is worth, I have a personal experience in using these trekking poles on the road and on the trails. 1. Do not use trekking poles for the first time in a trail running race without having used them extensively in your training. It follows the over-used advice in racing of not using something new during race day. 2. If the trail running event is a marathon distance or 50K, do not bother to bring or use these trekking poles if the total elevation gain is less than 3,000 feet or in a relatively flat course. 3. If the number of runners is more than 300 runners where the course is 100% single-track trail with less than a marathon distance (42K), don’t bother to use trekking poles as it will slow you down, slow down the runners behind you, or you might hurt somebody else in front or behind you. Use good judgement in using trekking poles on a single-trail trail, most specially in a most populated trail running event. 4. It is highly recommended to buy those trekking poles which could be folded in 3 parts as they could be easily stashed and held by the hands as if one is holding a baton while running. Since they are light, their weight is insignificant and they could be easily brought back to their intended lengths in a few seconds. There are hydration packs that have strings or elastic bands that could hold these poles or stashed/held by the pack while they are folded. Make some practice in removing or stashing the poles to and from the hydration pack during your training runs. 5. If you carry the trekking poles with your hands, while running, on its expanded length, make sure that there is no one behind you as you might poke the tip of the trekking pole to the runner while swinging your arms. If there is somebody behind you, make sure you don’t excessively swing your arms to the point that you might hit the runner behind you. You can have the option to carry the trekking poles with only one hand and be able to control that arm from excessive swinging or you can simply fold the poles and stashed them in your hydration pack or hold them with your hands. 6. If you intend to use the trekking poles with their extended length and if you are a slow runner or if you intend to power hike the first half of a 100K or 100-mile run, I suggest you start behind the runners and not mingle with the faster runners behind the starting line. However, if you are a fast runner and intend to be in the podium finish, you can have you folded trekking poles stashed with your hydration pack or just simply hold them with your hands. 7. In my experience of using trekking poles and seeing the faster runners using effectively these poles, I highly recommended buying a longer length from the suggested size or length that is based on your height. Three years ago, I bought a Black Diamond Ultra Distance Z-Poles with the length of 120 cms and I found it to be useful in my training runs as well as in my races. Last year, I bought another Black Diamond Ultra Distance Carbon Z-Poles with the length of 110 cms thinking that they are lighter and which are specifically recommended for my height. But I would find them to be the same weight with my 120-cm poles and I found them a little short for my height. In my ultra races in Hongkong, I found out that most of the trail runners have longer trekking poles than what their recommended size for their height and I tried one of my friends’ trekking poles which are 130-cm in size and I found them to be more adapted to my hiking/running style. Hopefully, I would be able to buy them soon! 1. If used in 50-milers, 100Ks and 100-milers and other longer trail runs, these poles will preserve ones leg power and strength for the long haul. In a technical route and with lots of stream/water crossings, the poles with provide an extra “leg” for balance and stability for the body, instead, of falling or injuring oneself along the route. 2. For safety and protection from wild animals and “creatures” along the route. The poles can be used to ward off snakes and other creatures in the forest/mountain that have the tendency to attack you. I once used my poles to “whack” or strike on the head of an attacking and barking dog in one of the populated areas in the mountains. My swing with the poles to the dog was so strong that it tumbled down as if the dog was knocked out by a baseball bat! 3. For contigency purposes, the poles can be used as a support to ease the pain or body imbalance just in case one has rolled an ankle, or in cases when a runner is injured. In cases of extreme accidents where there is fracture to the runner, I guess, these poles could be used as emergency splints! 4. I’ve seen a runner during the Translantau 100K where he was holding a very long trekking pole and I’ve seen him using the poles as “pole vault” as he jumped along the sides of a single-track trail while overtaking a group six runners on a single file! He did it while we were descending on the said trail. 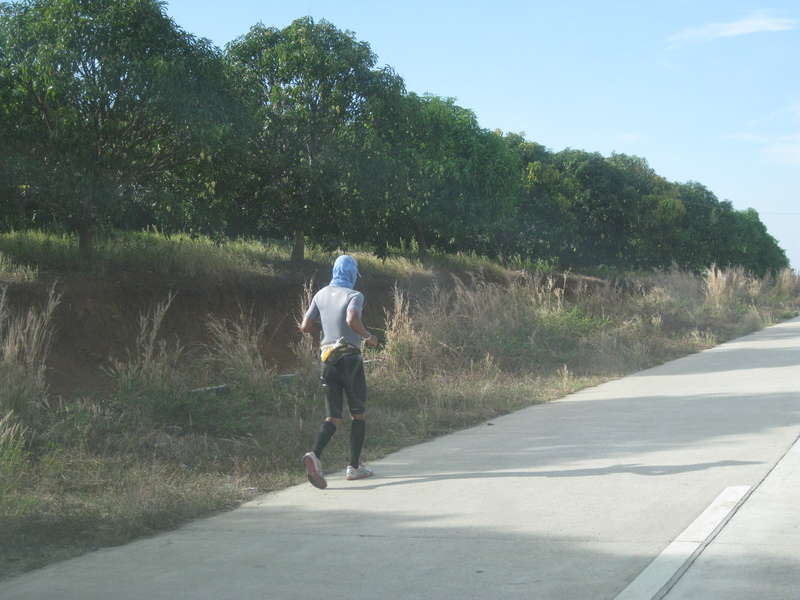 The runner was so fast that I was not able to see his back even if I was able to pass these six runners after him. 5. In this year’s Translantau 100, the winds on the second night was too strong that my body would not be able to stand on my own. But having my trekking poles as extra “anchor” to the ground as I was ascending on the last two mountains of the course, I would have stopped or crawled along the slope up to the peak of the mountain avoiding to be knocked down by the strong winds with almost zero visibility due to thick fog. 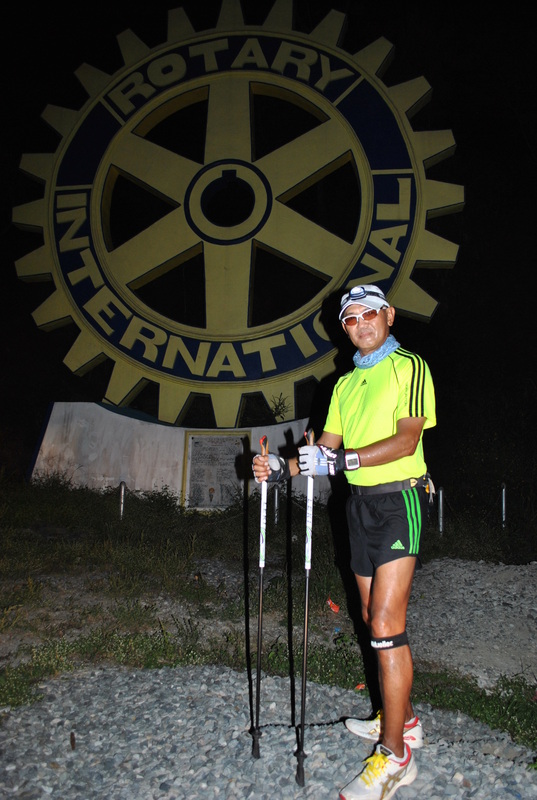 I was glad that I had my trekking poles with me while trying to keep my sight on the couple of runner in front of me. 6. 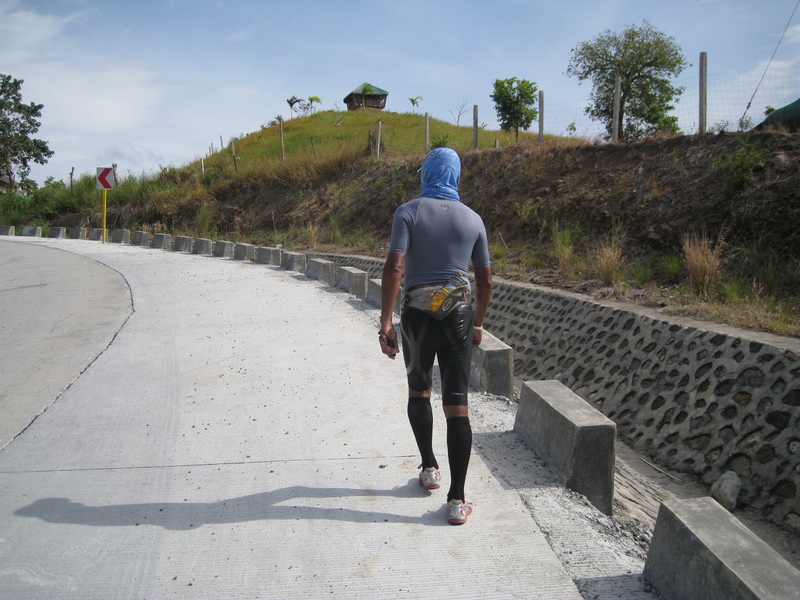 One time when I first joined the TNF Philippines 100, the trail was blocked by two water buffalos/carabaos and I with the rest of the runners behind me could hardly drive them away from the trail. By using the trekking poles as extension of my arms and raising them into the air, the carabaos thought that I was a BIG figure to contend with and slowly I was able to drive them away from the trail. But that incident and delay wasted a lot of my time and I eventually DNFd after one kilometre away from the place of incident. The trail was supposed to be the start of an ascending trail route towards Mt Santo Tomas which considered as the most challenging part of the course. 1. Obviously, it is an additional gear to be carried by the runner which means additional weight. Even if the trekking poles has a total weight of 280 grams, carrying it or holding it on a 50-mile, 100K or 100-mile or within a duration of 30 hours would be taxing to the body and you may end up carrying a total of about ten kilos or 5 pounds on the course. Additionally, it will delay you for some seconds in unfolding and folding them while you are running. If you add these few seconds within the distance of 100 miles, they will add up to minutes of maybe half an hour! Without proper training and technique on how to effectively use these trekking poles would mean a delay in finishing ones race. 2. 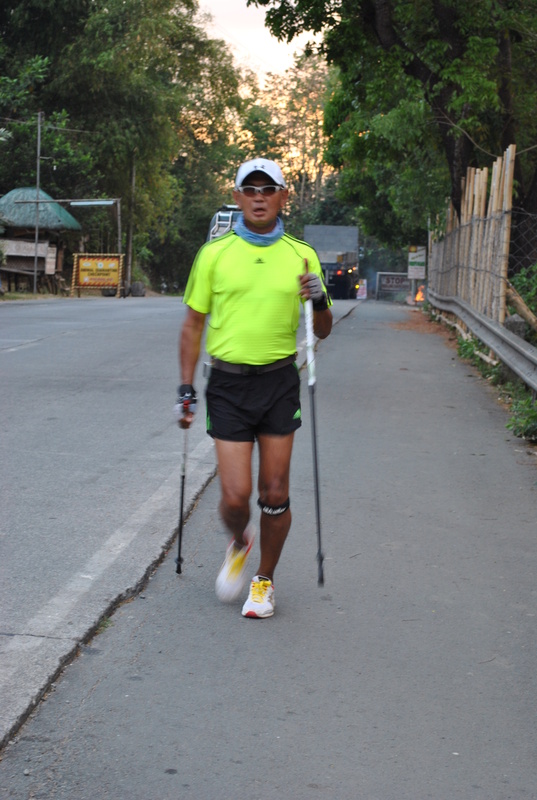 In my three-year successive finishes of the Clark Miyamit 50-Mile Run (CM50), I have never used my trekking poles. I was then 61 years old when I had my first finish in this race and I would outpace and pass younger and stronger runners on my way up to the highest elevation of the course which happens to be the turning point of the race back to the Start/Finish Line. Simply put, if you have the proper training and preparation, there is no need to use those trekking poles in a 50-mile race. If you are less than 50 years old and I see you using a trekking pole while we are competing in the same race, my smile to you would mean that you are a “weak & newbie” trail runner! 3. In some of the international races, they allow runners to carry trekking poles but if the route is a “single-track” trail, they advise you not to use them, most specially if you have runners in front or behind you who are one or two steps away from you. There are also ultra races that require the runners not to use their trekking poles at the first 20-25 miles as most of the runners are running near to each other. Make sure that to ask from the Race Organizer/Face Director if the use of trekking poles are allowed in the race if their use is not stated in its rules and regulations. 4. Do not use trekking poles for the first time in a race you are going to compete. You will be saving the strength of your legs but your shoulder and arms muscles will take a lot of beating that you might no longer move your arms during the later part of the race or after the race. At my present age of 64 years old, the trekking poles are my “necessities” and mandatory gear in my training and future races. I will be using them more often as I have already bought the proper size for me. I have one year to train with them in preparation for my plan to join the @CCC in Chamonix, France next year, hoping that I will be in the race after the lottery. After the Awarding Ceremony & Get Together Party for the 2012 BDM and PAU Races, I had already a plan in my mind to try the initial King of the Mountain Road Race envisioned by Jonel two years ago. 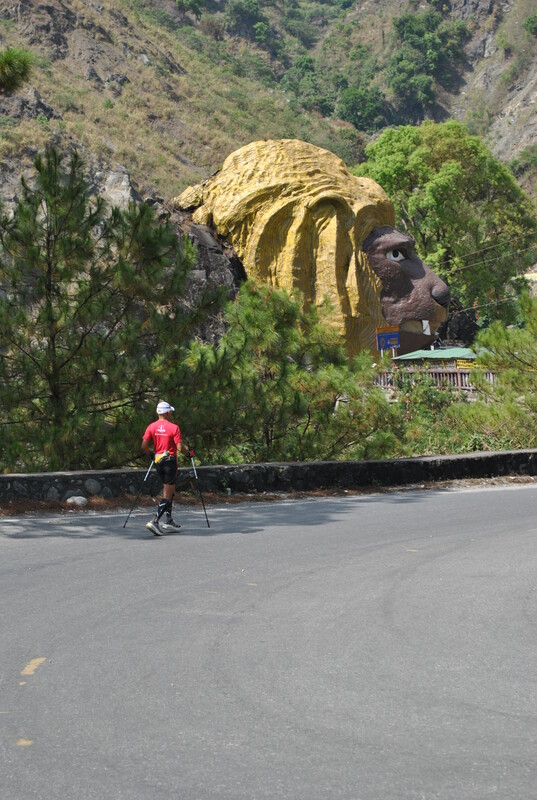 This is the Road Race which he dubbed as the Baguio To Baguio Route which is popular among professional cyclists and the popular cycling lap that determines who would eventually win in the yearly Professional Cycling Event in the Country. However, the main reason and goal of this running trip/adventure run was to be able to recon the King of the Mountain Mt Ugo Trail Marathon route which I was planning to join. 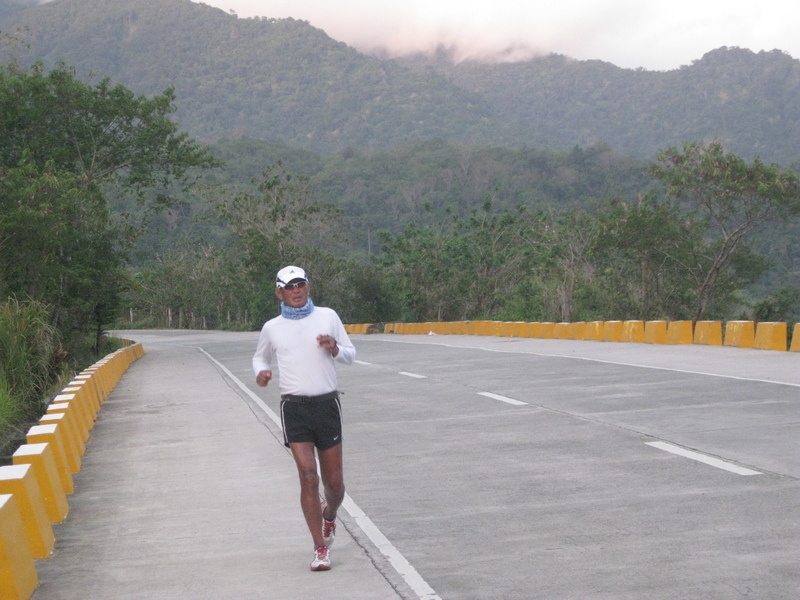 Running along the Marcos Highway, Kennon Road, and Naguilian Road would serve as my easy long runs as part of the training before going to Kayapa, Nueva Vizcaya. 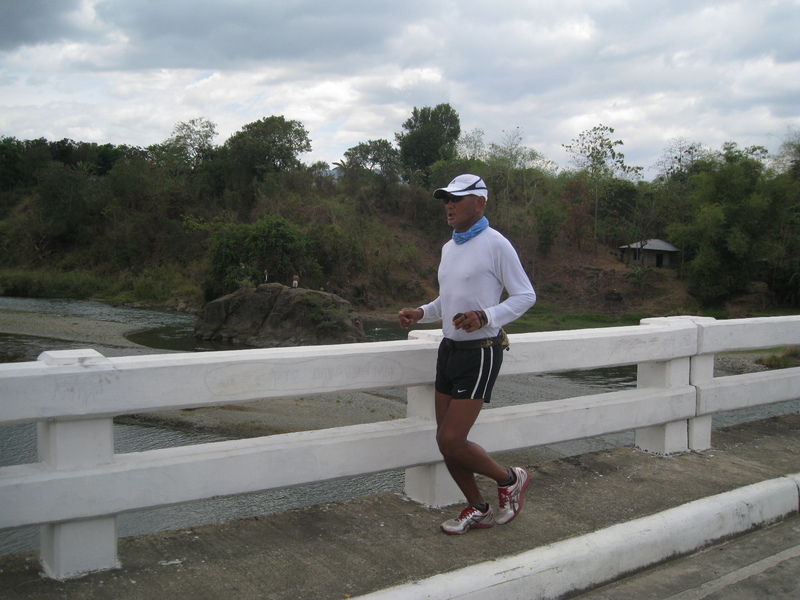 Coming from Manila after breakfast of Friday, March 9, I drove my car without any target time for me to start my run as I planned to start at the Saitan Junction in Rosario, La Union once I reach the place and after wearing my running shoes. At exactly 3:00 PM, I arrived at the planned starting area and I was surprised to see that the structure on the said place is already abandoned and left to rot and decay. I wonder who is supposed to be responsible for its upkeep and cleanliness. Anyway, I parked the car and started to eat some cooked foods which we brought for my adventure run. We had cooked rice, pork and chicken adobo and fried fish. After my full meal, I changed to my running attire and I was ready to start my run. My route has to take the Maharlika Highway going to the town/poblacion of Rosario, La Union and then turn right at the Junction which is the start of the Marcos Highway which is now called, “Ben Palispis Highway”. I wonder who is this guy who replaced the name of the former President of the country! 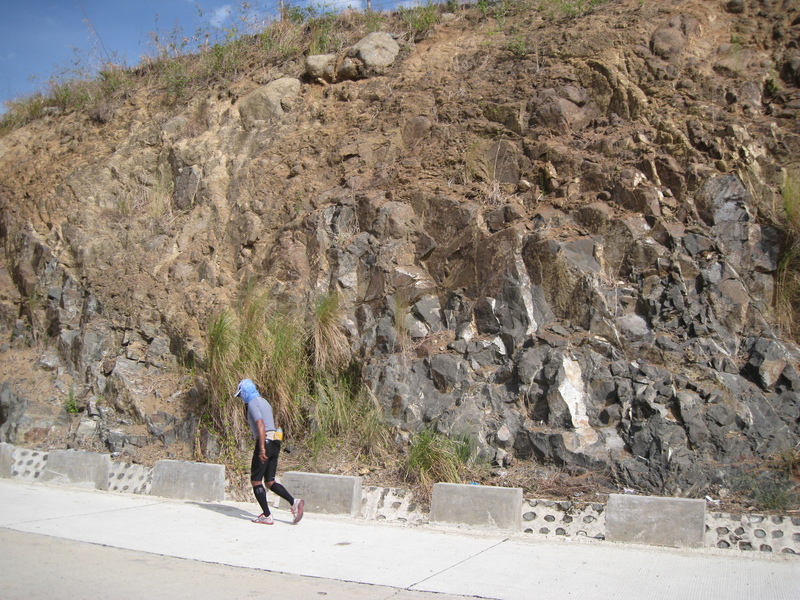 From the Junction, the Marcos Highway would lead me to Baguio City. I finally started my run at 3:30 PM. Strictly following my run-walk method of 3 minutes of run & 45 seconds brisk walk, I was able to progress my ascent to the summer capital of the country. My support vehicle would be able to “leap-frog” every 3 kilometers which is the estimated time that I would consume the water or Gatorade mix on my “Sprint” Nathan hand-held bottle. 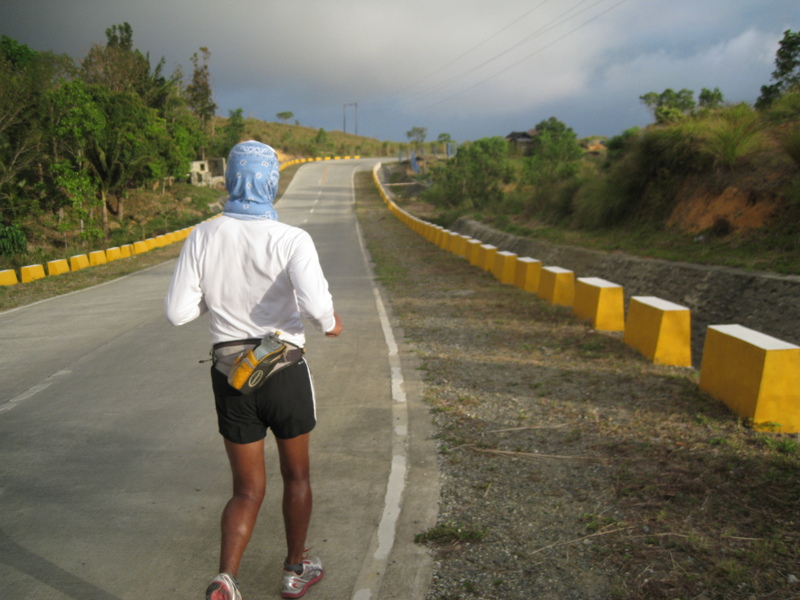 The last 5 kilometers climb to Baguio City would be the most challenging part of the route as I had to brisk walk most of the distance. 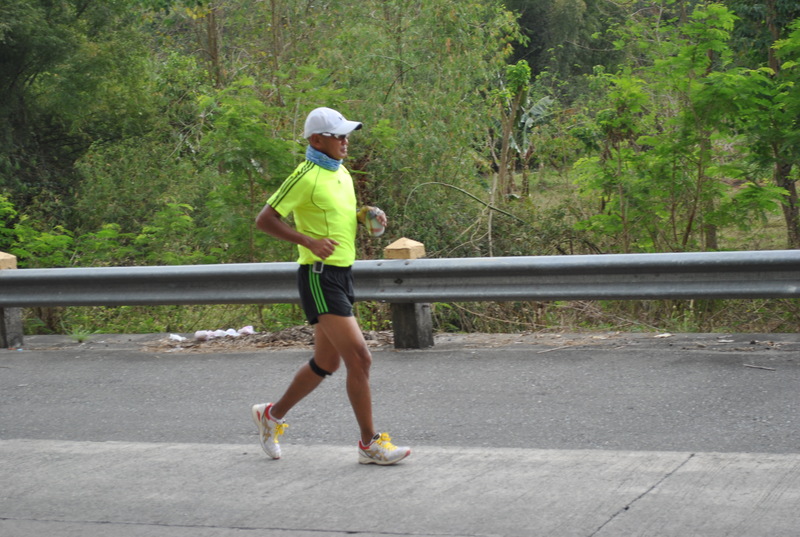 I was able to run and walk the Marcos Highway going to Baguio City, a distance of 47 kilometers with a total gain of more than 6,000+ feet from the place where I started, at Barangay Saitan, Rosario, La Union. I did it in 8:20+ hours. I stopped my run infront of the Baguio General Hospital. 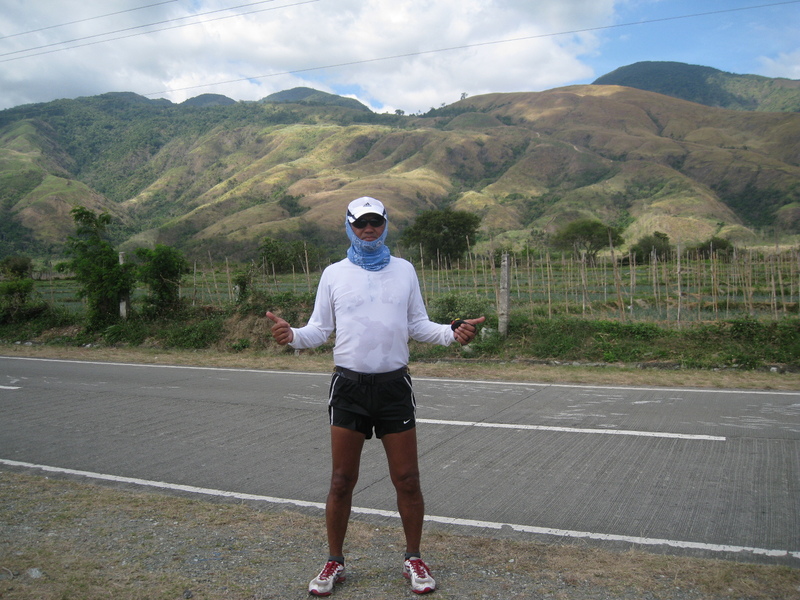 After an overnight rest in one of the decent hotels in Baguio City, I continued my run the following day from where I stopped and run through the famous Kennon Road going back to where I started. It was all downhill but I had to be cautious because I don’t want my quads and knees to suffer for the pounding with the distance of 33 kilometers. My trekking poles provided me with much comfort on those steep downhill portions of the route. With longer “pit stops”, I was able to reach my destination in 6:00+ hours. 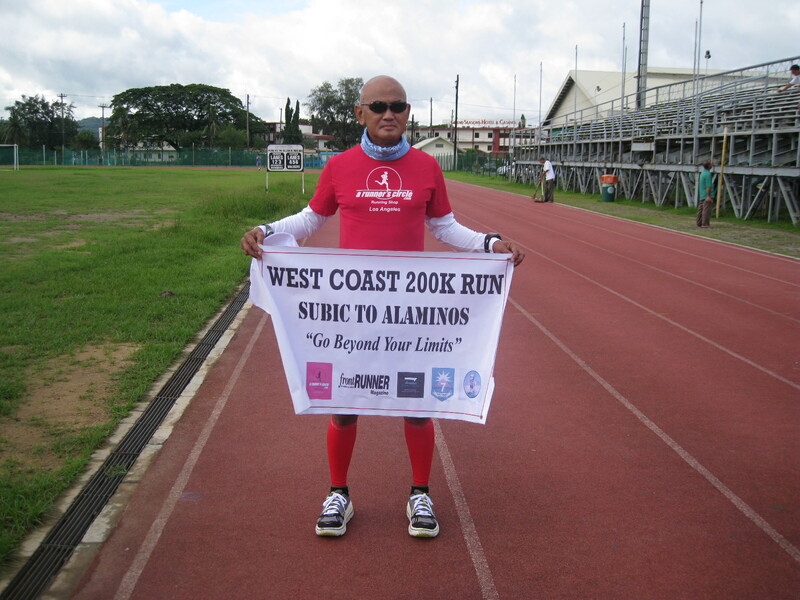 After completing the 2-day running feat, I would discover that the total distance would result to 80 kilometers which is a good 50-miler route for an ultrarunning event. 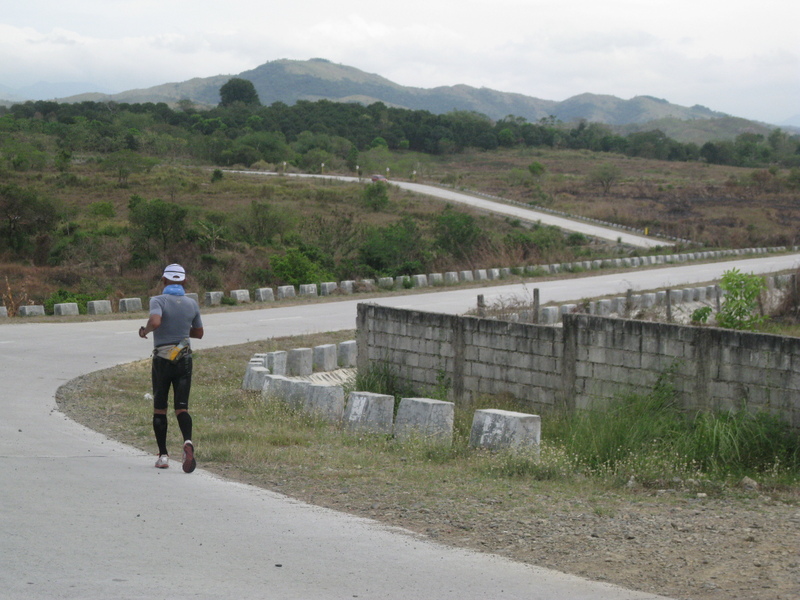 Thus, I decided to dubbed the event on this route as the “Marcos-Kennon 50-Mile Ultra Road Classic”. A status posted at FB gave some commitments from running-friends to help and support in the conduct of this event. Thanks to my ultra running friends! I’ve decided not to run the Saitan, Rosario to Bauang, La Union route along the Maharlika Highway and instead, measured the distance aboard my car using my GF 305 watch. The distance registered at 53 Kilometers. Stayed overnight in Bauang, La Union. Enjoyed the food, beach and sea breeze of the place and I enjoyed my much-needed rest. From the Bauang, La Union Junction to Baguio City, the distance is 44 Kilometers up to Burnham Park. 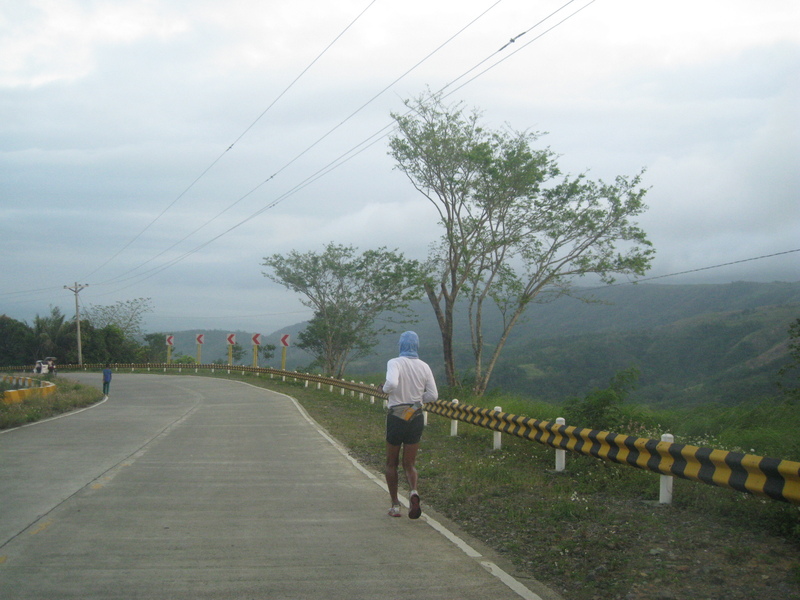 I did not run through the route but I simply observed the terrain closely as I drove towards Baguio City. I will let Jonel push through with his plan Baguio-Baguio Route to be implimented. However, I will just take a portion of the said route as another challenging race route for interested ultrarunners to experience. 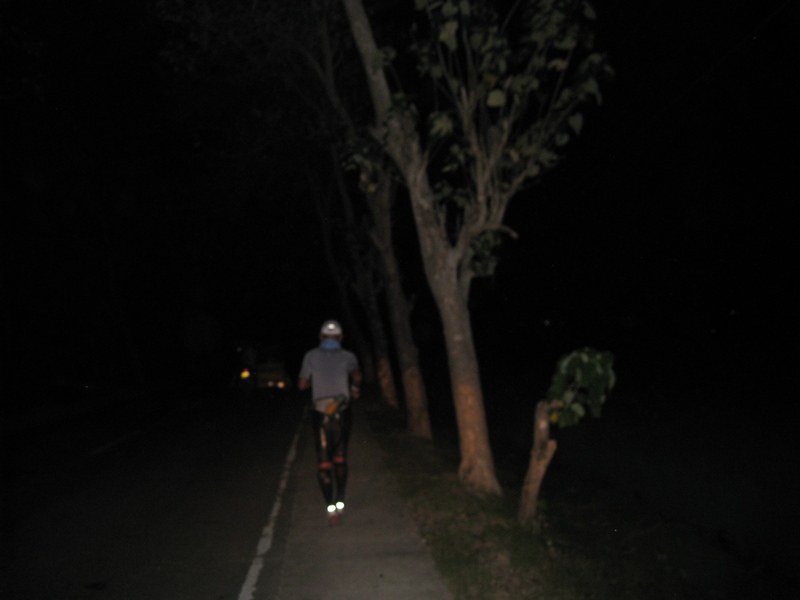 Thus, the “Marcos-Kennon 50-Mile Ultra Road Classic” is born. Planning for this race route is not complete if I don’t share to you what are the detailed expenses incurred in order to discover and plan a certain ultrarunning route. This is excluding for the Payment for the Wear & Tear/Service for the Car that I am using in my Recon Runs. And since this is my passion, I don’t give a price or costing on the time and effort/services I have to provide in order to create a safe road race for everybody. In addition, the daily salaries of my driver and assistant/support crew are not yet included in the above costs! 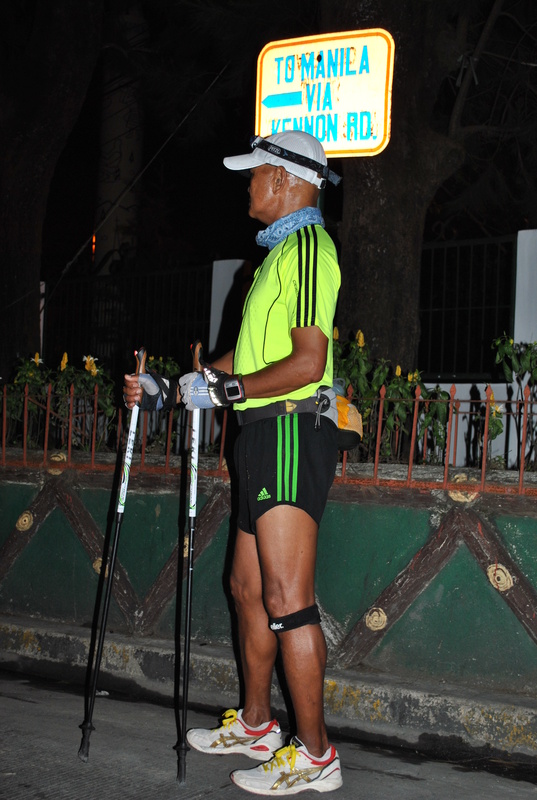 I hope in the future, Jonel would be able to stage a multi-day running event on his original Baguio-Baguio Route. The Ultra Race along this route will come sooner than you think! Keep on running! 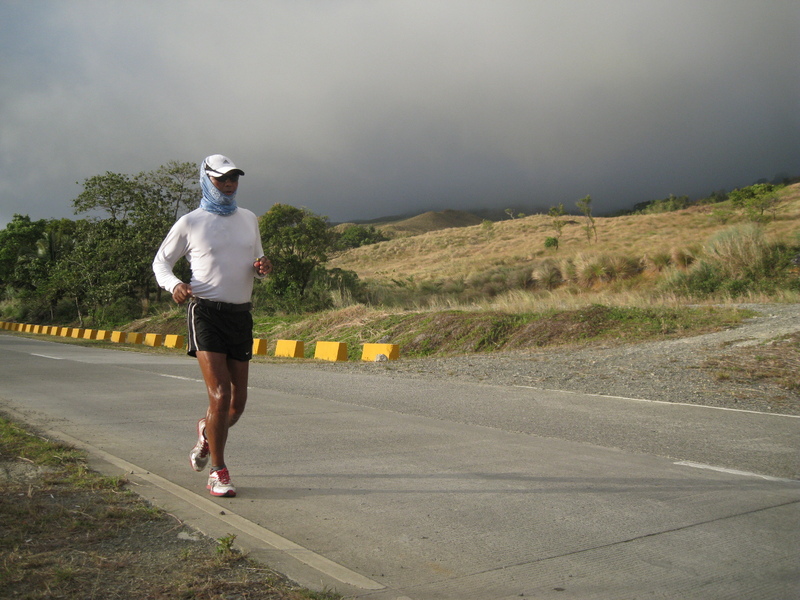 At 10:00 AM today, September 21, 2011, I started my Adventure Run (for the 2nd time! 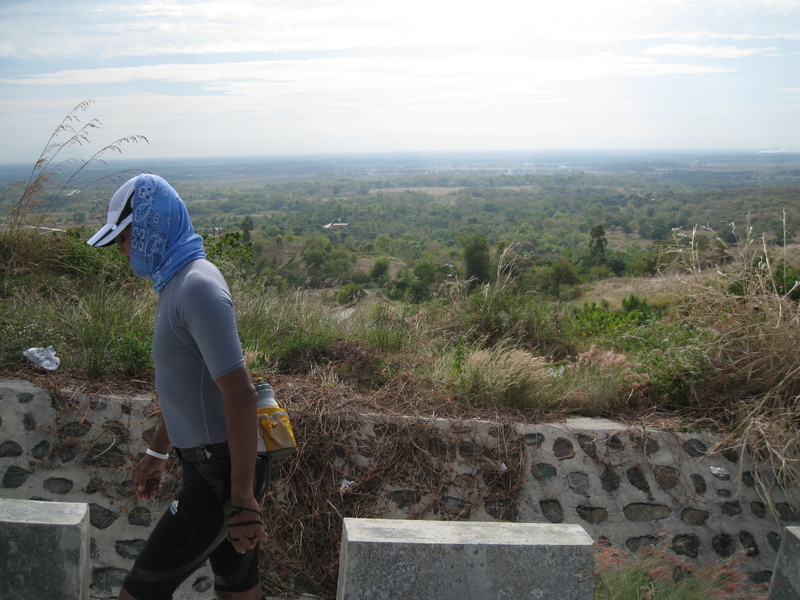 )—from Remy Field Oval Track to Alaminos, Pangasinan. 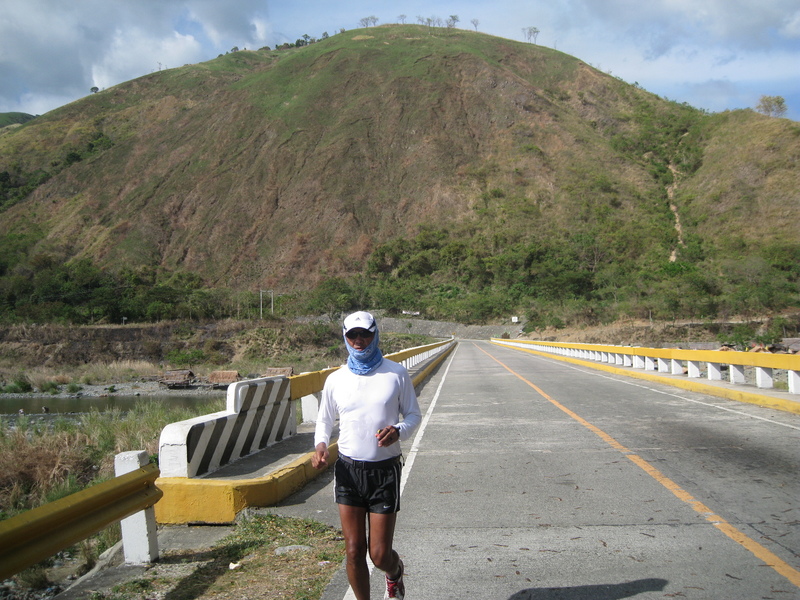 I have to repeat what I’ve started last week (September 14) when I had to stop this run after I was bitten by a dog at Km #41 in Poblacion, San Narciso, Zambales. As I post this update, I am one kilometer away from the exact place where I was bitten by a dog. 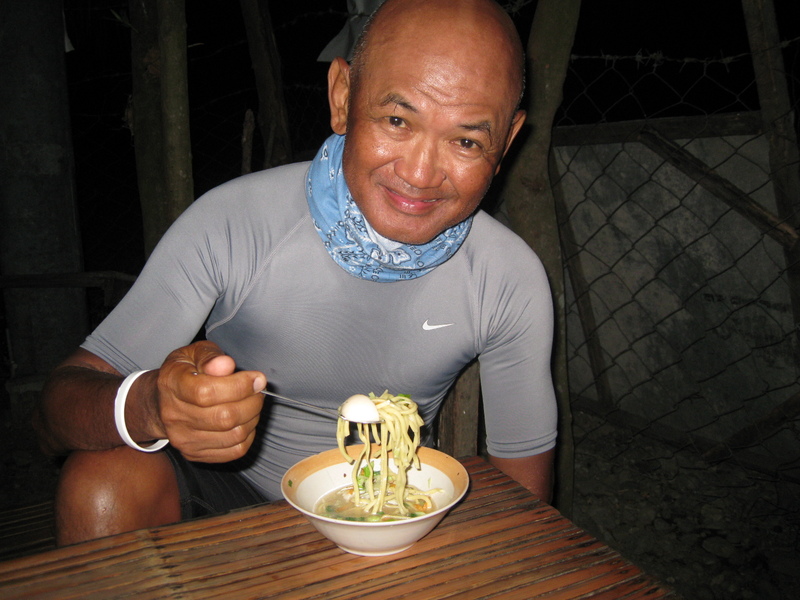 I just finished my dinner in one of the carinderias along the Olongapo-Bugallon Highway. On of my readers asked me if I am using a Sunscreen Lotion during my run. Unfortunately, I did not bring my 10.8 Fluid Ounce plastic bottle of Hawaiian Tropic SPF 50 Plus Sunscreen Lotion. I had some bad experiences when I use such lotion. At one time during my practice runs, the sunscreen lotion I applied on my head, forehead and face got mixed with my sweat and some got into my eyes. You could just imagine the pain that it brought to my eyes that I was temporarily blind during the run. I had to look for water and soap to rinse my face and head in order to remove the sunscreen lotion and then washed my eyes with clean water. Another experience happened again when I was playing golf. A mixture of perspiration and sunscreen lotion got into my eyes after driving the golf ball from the tee mound. From there, I was distracted from my game and end up going home. The “stripes” I got from the heat of the sun will be finally gone in a few days with the help of lotion and the powers of Papaya Soap! I really do not know the effects of the sunlight on my skin as I grow older and as I continue running under the heat of the sun. I would end up like the skin of my friend Wayne Plymale or Jeff Galloway but it would be a honor to have a skin like them. 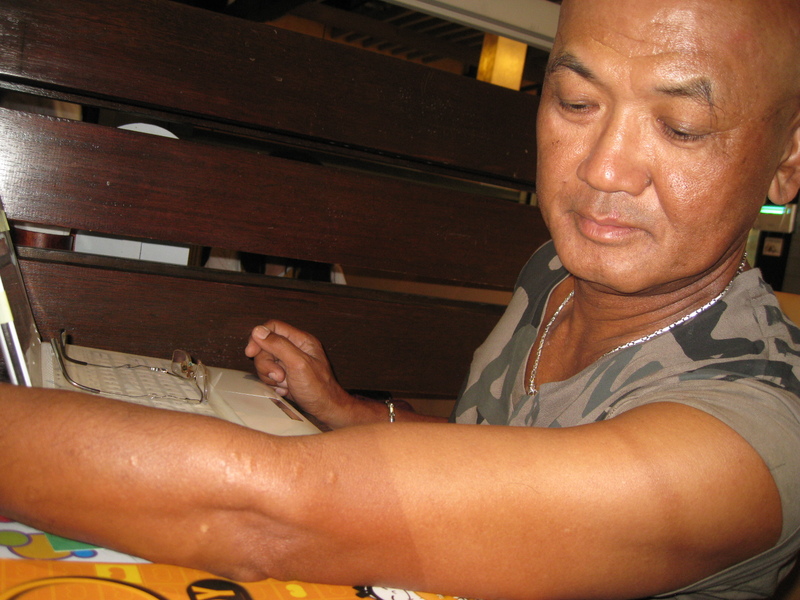 One of these days, I will try to see Mang Victor Ting’s skin to find out what is in store for my skin in the future. The burned skin on my legs due to the heat of the sun are already peeling off and I have some patches of white dead skin combined with my actual dark brown colored skin. I hope these burned skin will peel off soon faster! I am still on a rest and recovery mode but many things are already playing in my mind about ultra running (and marathon races) here and abroad. See you on the roads and trails soon! For those who have recovered already from the BDM Races, I hope to see you at the 1st Mt Mayon 360 Degrees 50-Mile Endurance Run. This is the first PAU-sanctioned road race for the year. 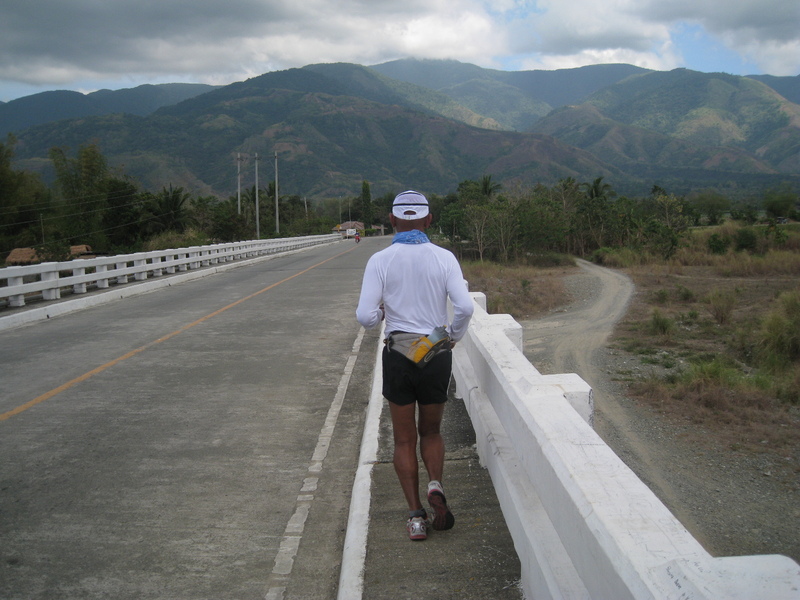 If you want to earn your points for the most coveted “PAU Runner of the Year” (PROY) Award, you have to join this run! See you in Legazpi City this coming weekend! Laur, Nueva Ecija is a small town where the National Highway does not pass on its Poblacion or center of the town. If you are travelling towards Gabaldon, NE, you could barely see the town as you need to turn left from a corner where the only Petron Gasoline Station is located. There are no common or popular commercial establishment or popular fastfood restaurants in the place. There was only one place where it serves cooked food and this was the place where I had my brunch with my team. 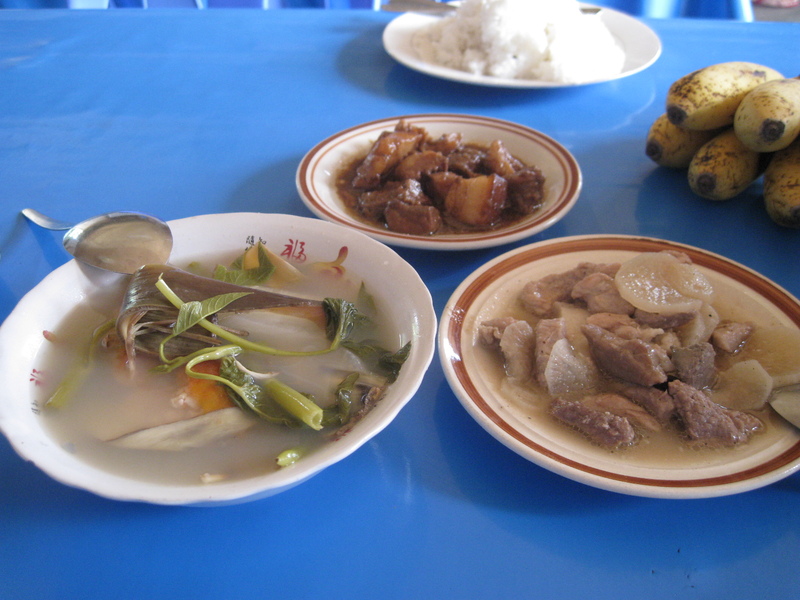 The food was simple—sinigang na bangus, pork adobo, sauteed meat, and rice with fresh banana. The food serves its purpose as my source of energy for the day. I was on a relaxed mood after I finished my brunch and took my time to reach Km Post #145 which is only less than one kilometer away from the Poblacion. 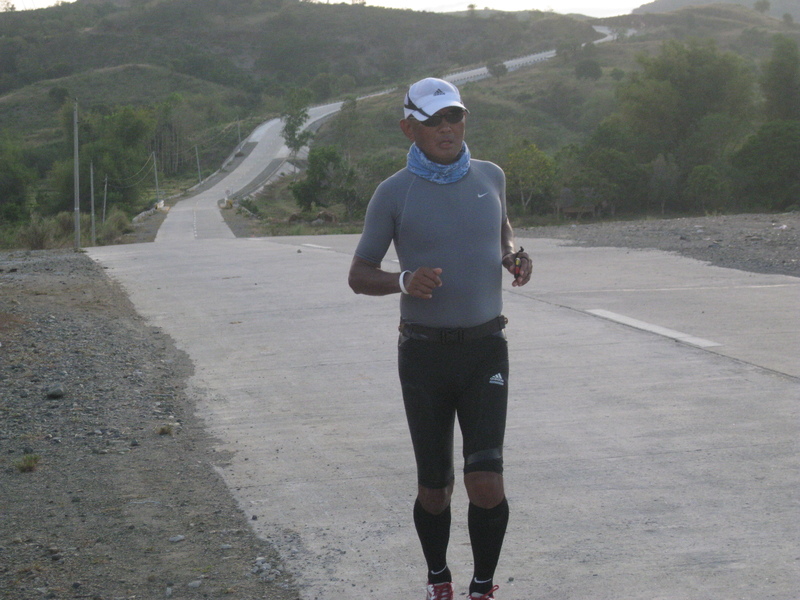 I knew that this will be my last day of my adventure run and very confident that I will reach my destination without any “issues” or accidents along the road. I just have to maintain the things that I’ve done for the past days and I let my body on “automatic” mode once I start my run. 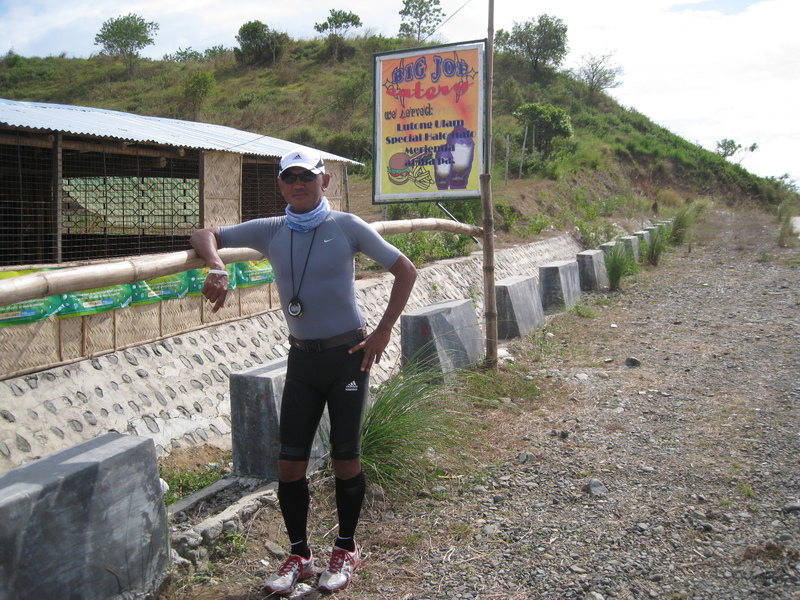 It was at the Kilometer Post where I wear my ASICS Gel-LyteRacer and my Gray DryMax Running Socks. After wearing and checking the accessories I need to wear, I started my run with a simple prayer and sign of a cross, a ritual I’ve never missed to do every time I start my run. I am not a stranger in this place as it was part of my Area of Operations (AOR) when I was a Brigade Commander of the 7th Infantry Division of the Philippine Army. I always visit Gabaldon and Dingalan because it was our Advanced Command Post (ACP) whenever we had combat and civil-military operations in the mountainous and forested areas of these two towns. But times have changed since then. The roads are now cemented and well-built with the proper drainage and structured concrete bridges. More houses had been built along the Highway. There are already elementary and high schools built in most of the more populated barangays. And there are newly constructed and developed garden and water resorts in the area. I was assigned in these areas for 2 years and 4 months. What I like with Gabaldon are their Onions! 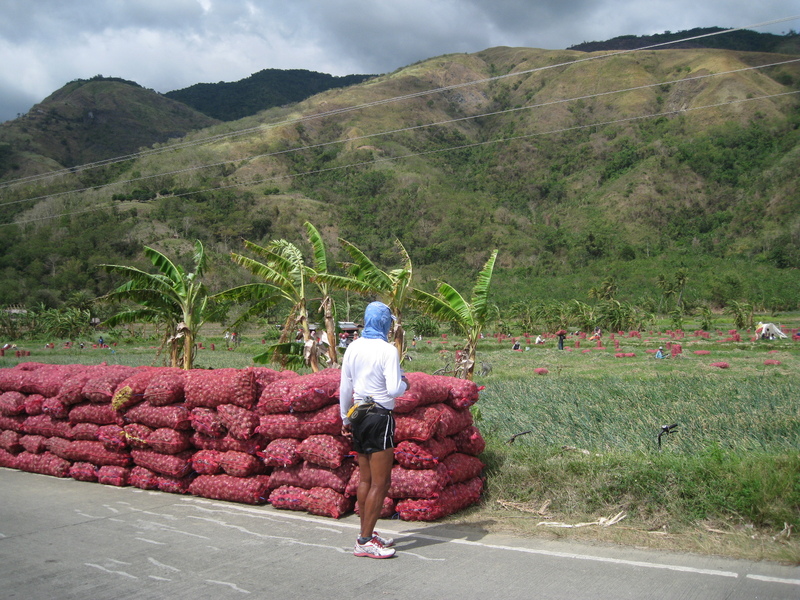 Gabaldon is considered as the Onion Capital of the Country. They cultivate and produce the white and the red onions. There were times when the price of these onions would go down to P 5.00 per kilo and a bagful (20 kilos) would only cost P 100.00! I usually bring some of these onions (in bags of 20 kilos) to Manila and give them as a gift to my friends, peers, relatives, superiors, and subordinates. Well, after a few days, they complain to me that they smell like onions already! On the other hand, the more smart traders/businessmen from Visayas and Mindanao would buy these onions when the price is low and have them transported to their “refrigirated” warehouses so that the freshness of the onions will be maintained even after months of being stored. And then sell them when they supply is low. It’s a good business! 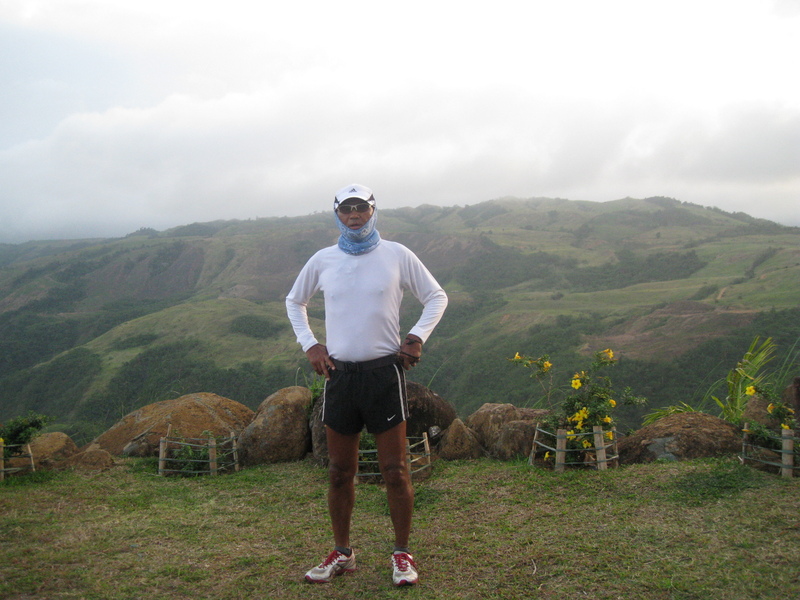 On my last day of my run, I opted to use my ever reliable Patagonia Capilene White Long-Sleeved Shirt. This is the same shirt that I used in last year’s Marin Headlands 50-Mile Train Run. It is not tight but it gives me a comfortable feeling when I run. 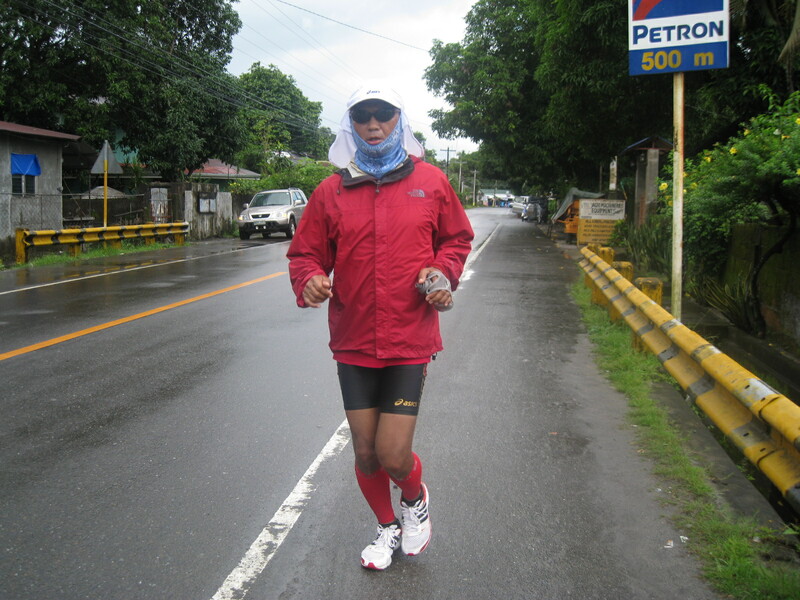 As for the running shorts, I used a NIKE running shorts which I bought (at a discounted price) in a NIKE Store at the Caltex Gasoline Station along the NLEX. 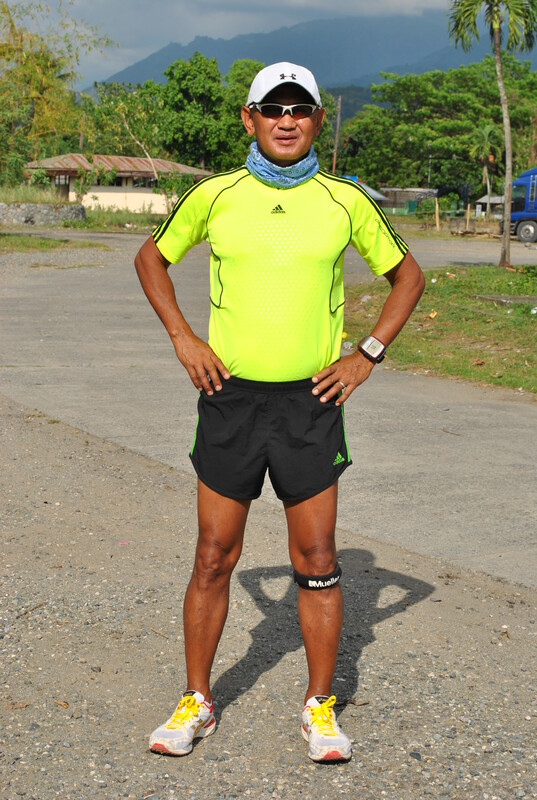 The running shorts is nice and comfortable that I did not have “issues” on my upper inner legs and crotches. I was already confident that I really did not need the Adidas Tech Fit Compression Short for this particular leg of my adventure run. I wanted to appear in my pictures as a traditional runner! The DryMax Trail Socks is thicker than the ordinary running socks and it fits well to my ASICS Gel-LyterRacer. I have no worries if my socks will be wet from the water that I pour on my neck and head, and perspiration from my body that goes down to my legs. I knew these socks will not give me any problems with blisters. 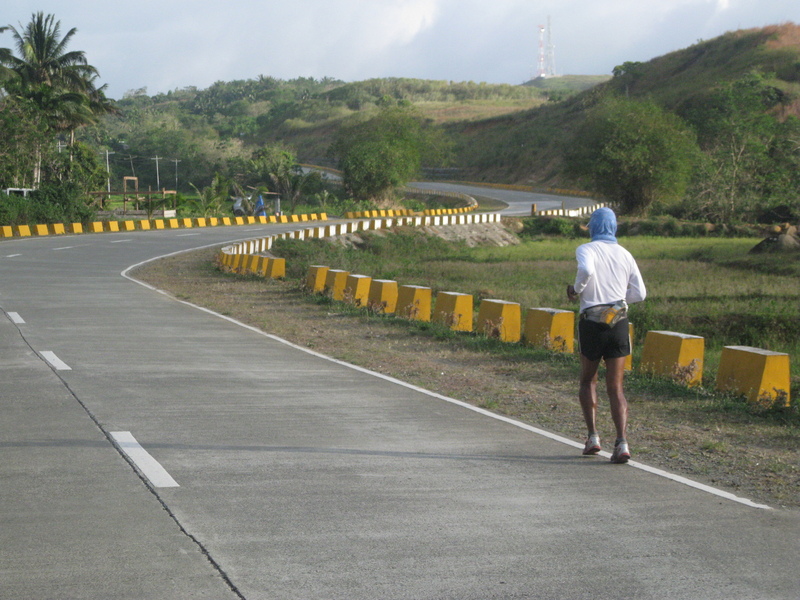 As soon as I started my run, the places that I passed and looked forward became familiar as I recall those times when I usually pass along this road going to Gabaldon and Dingalan. The scenery of the place is really amazing. This is the place where you could see clean and crystal clear flowing water on rivers. I’ve never seen such kind and condition of water on rivers that I passed in the provinces of Pangasinan and Tarlac. The mountains and hills are also amazing to behold. Although most of these mountains lack those thick forested areas, their size, formation and the different colors from their vegetation could give refreshing feeling to the eyes. How I wish these hills and mountains have trails where runners could walk and run. I hope to return to these places and talk to the locals and get more information about the trails on these mountains. I have observed that the road is clean from Laur to Gabaldon. I did not see any trash or unnecessary wastes along the road. 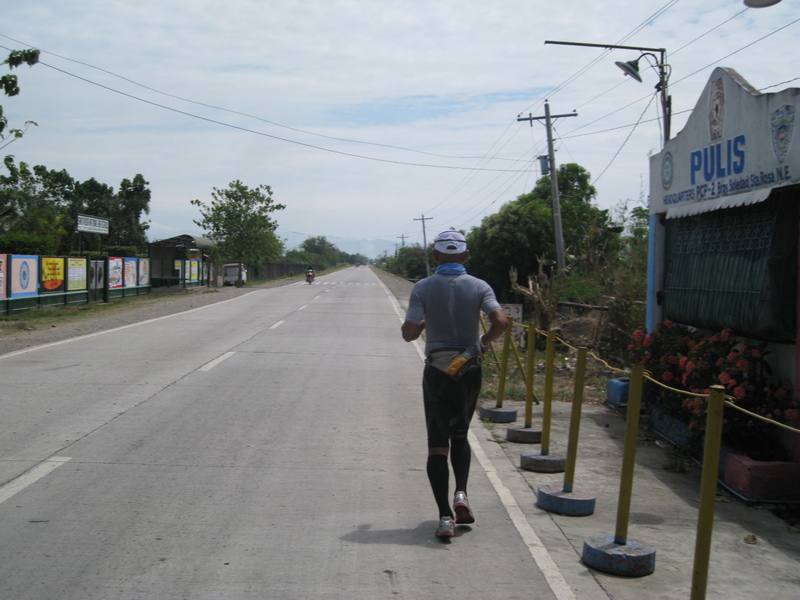 Even when I reached the Poblacion of Gabaldon, I did not see any trash along the road. But what I’ve observed was that there are parts of the mountains which are burned. Burning the grass on the mountains had been an annual practice of the people thereat. The burning of the grass is a way for the grass to re-grow and the new grass growth is a good food or feed for the cattle in the area. I have to maintain my nutrition strategy during the run. I usually take a meal before my daily run as it gives me the necessary energy to last me for 1 1/2 to 2 hours and I don’t ingest any sports gel. I maintain my hydration strategy by drinking a sip of water evey two kilometers where my support have “leap frogged” ahead of me. This is repeated up to the time I reach 1 1/2 hours of running. After this, I drink one-half bottle of Sports Drinks and every 1 1/2 hours thereafter. If I feel hungry, I take those Nature Valley Sports Bar and/or Chips Ahoy Cookies. If there are fresh fruits, like banana or mangoes. I take them when I feel hungry. As for my running & walking strategy, I dropped using the Galloway Method of following a run-walk ratio religiously. 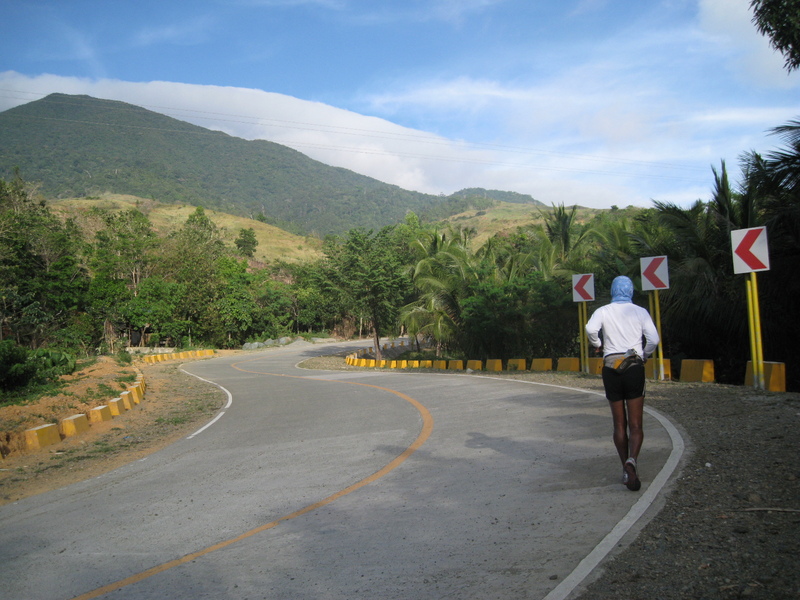 I simply followed my ritual of running along the descending and flat portions of the road and simply brisk walking on the ascending portions of the road. However, I tried my best to quicken my average pace during the run. The counting of strides was still religiously followed most especially during those times when the heat of the sun and the cement were very challenging. The counting kept my sanity during the run. Of course, there are times also that I pray when I feel that I was exhausted. In one of the legs/days of this adventure run, I tried a run strategy where I have to run hard on the early hours and sustain whatever strength I have left in my body in the later hours of the day. To be specific, I have to run 8 kilometers for the first hour; 7 kilometers for the second hour; 6 kilometers for the 3rd hour; and then maintain 5 kilometers for the 4th and succeeding hours until I end the run for the day. So, if I am going to run for 8 hours for the day, I would be able to finish at least 46 kilometers for the day. Nice run strategy but it really puts pressure on me. If not for the swelling of my left quads and the pain that goes with it, it would have been doable. 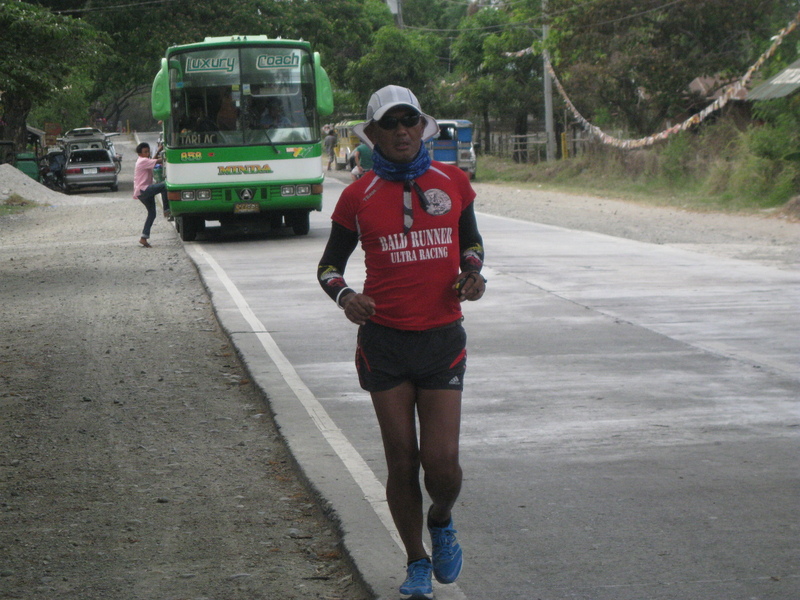 Due to my predicament after the Camiling-La Paz Leg, I maintained an average pace of 5 kilometers per hour but it became slower when I reached the uphills of Fort Magsaysay-Laur-Gabaldon-Dingalan areas. Although I was able to recover on the last two legs of this run, I did not think of taking the risk of increasing my pace on a tempo run mode but maintaining the LSD mode would be the nice decision for this adventure run. The goal is to finish this adventure run where I can still stand up and walk on my own and drive the support vehicle back to Metro Manila. For so many times, I’ve taken pictures of mountains that resemble the mountains in Marin Headlands in San Francisco, California in almost all the places that I passed through. I know for sure that that there are trails on these mountains and they could be used for trail running events in the future. I know for sure that once upon a time, these trails had been used by the insurgents and military patrols at the height of the government’s efforts to thwart the spread of insurgency in the country. Sometimes, I would think that trail running in some of the mountains in the country would drive away those insurgents to higher mountains and more forested areas. However, on the places that I passed through, these mountains are already cleared from the insurgents. 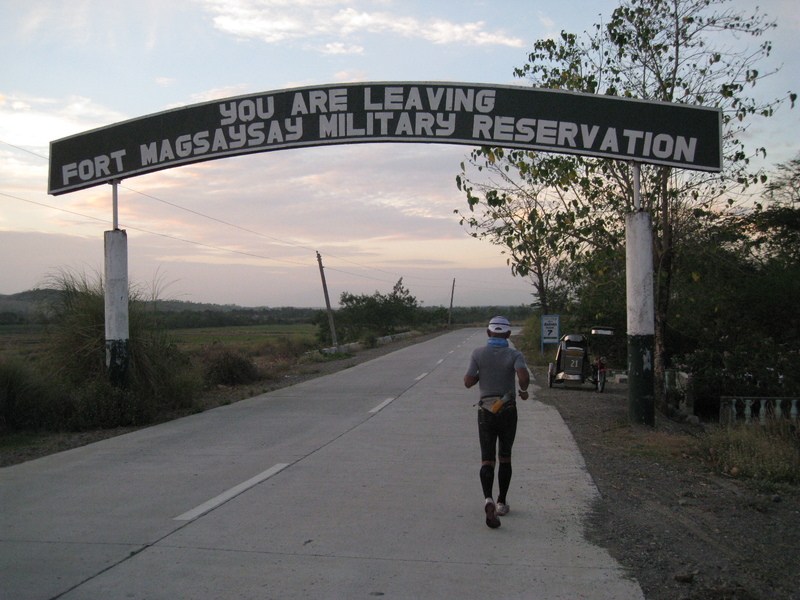 The challenge now is to find out the trails inside the Fort Magsaysay Military Reservation Area. This would be the best place to conduct an ultra trail running event in the future. I’ve been thinking about this while I was running through the places at Fort Magsaysay the previous day. It is doable and runners would be excited to experience an ultra trail run on a regular basis within the year. I was also thinking during my run to purposely travel from Manila up to Fort Magsaysay by taking the NLEX-SCETX-La Paz-Zaragoza-Santa Rosa-Fort Magsaysay Route to find out the travel time. 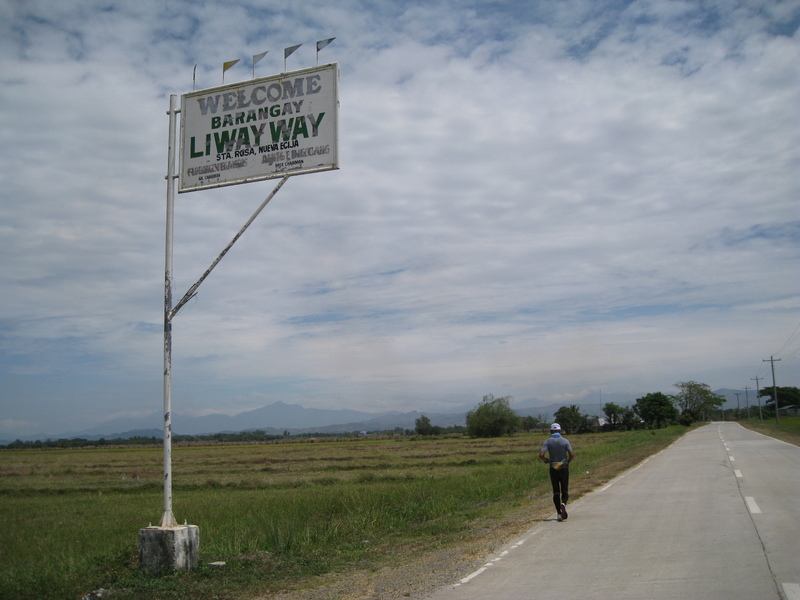 Before the SCETX was constructed, the route to Fort Magsaysay would pass along the busy eastern towns of Bulacan and the southern towns of Nueva Ecija. Before, it takes 3 1/2 to 4 hours to reach Fort Magsaysay from Manila even if I take the shortcut route from Gapan, Nueva Ecija to the Southern Gate of Fort Magsaysay through Papaya, Nueva Ecija. I would say and suspect that Fort Magsaysay could be reached in 2 1/2 hours by taking the new route. I will try to prove if my suspicion is right in the coming days. It was uneventful that I was able to reach the Poblacion of Gabaldon, NE. This town is the location of the Nueva Ecija University of Science and Technology. 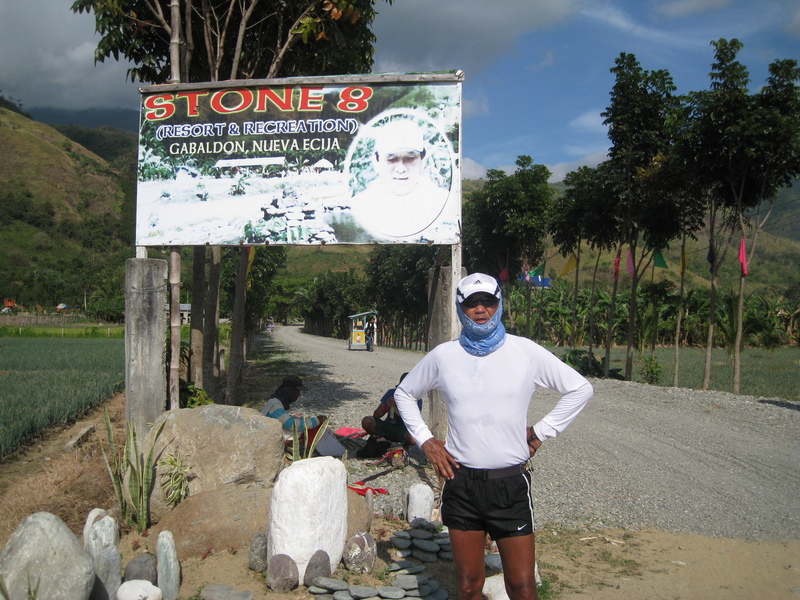 I had my pictures taken infront of Resort 8 where we stayed overnight before this day’s run. 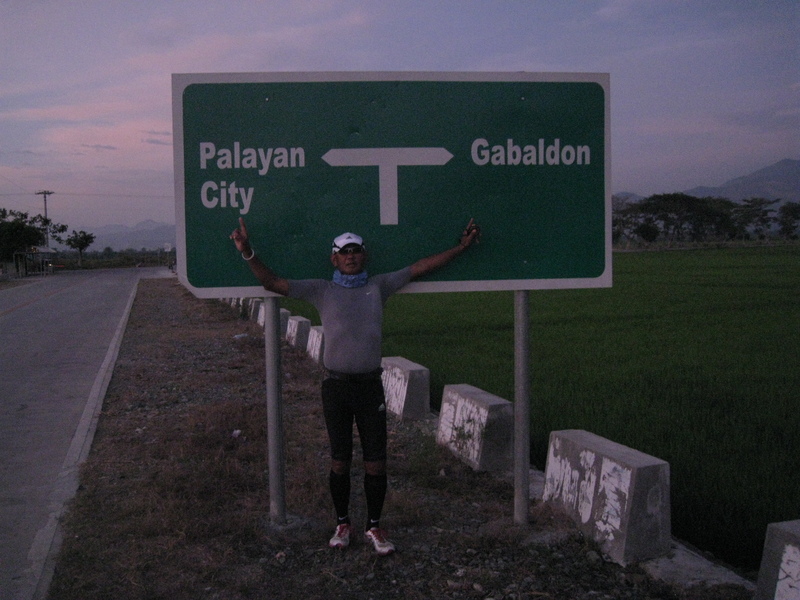 From that point, I had 5 more kilometers to the Poblacion of Gabaldon. Dingalan is the southern most town of Aurora Province and you need to travel through Nueva Ecija in order to reach the capital of Aurora which is Baler. Dingalan Bay is being planned to be the eastern seaport of the country and this could be the reason why the government constructed the SCETX as it would connect it to Subic Bay Freeport. A high-speed highway from Dingalan Bay to Subic Bay Freeport would cut the travel time of goods/materials from the Pacific Ocean to South China Sea or vice-versa, instead of the transport ships coming from the Pacific Ocean to go all the way south to the tip of Bicol region and finally going northwest to Manila Bay. 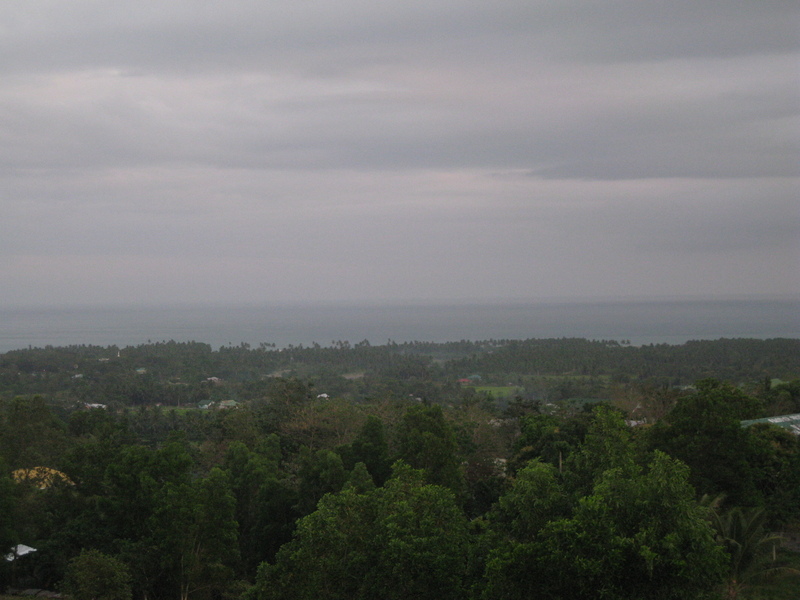 Dingalan Bay had been the source of Yellow Fin and Blue Marlin Tunas. When I was assigned in this area, a kilo of these fresh fish cost only P 45-50.00. My officers would buy by bulk (minimum of 10 kilos) and had the meat of the fish packaged and frozen into sashimi cuts. Whenever we have visitors from our Higher Headquarters and from our Operating Units, they were surprised when we serve them with sashimi with Wasabe Paste and Kikkoman Soy Sauce. I hope that those fresh catch tunas are still cheap at present. Getting Colder In The Late Afternoon! It was already dark when I reached the last kilometer post. 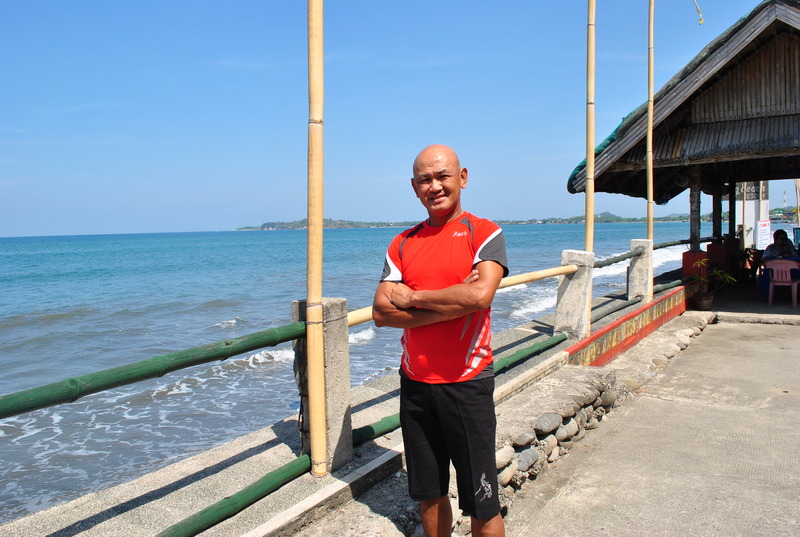 After the usual photo-ops, I ran another 600 meters towards the Dingalan Beach. The Dingalan Beach within the edge of the Poblacion is full of black stones while the neighboring barangay farther south has a beach with black/dark sand. 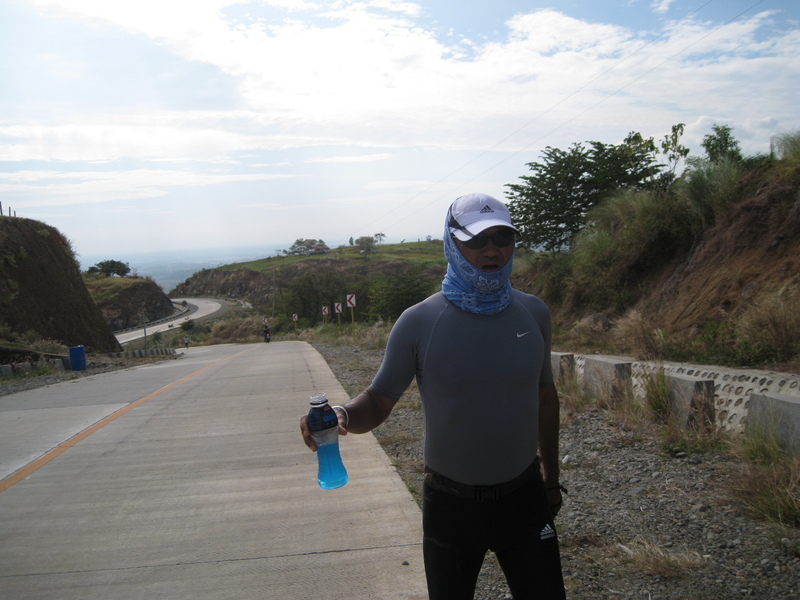 After a picture pose at the Dingalan Beach, I grabbed my Nathan Bottle that I carried throughout the Adventure Run on my Nathan Hydration Belt where the Salt Water from Bolinao Beach was placed and contained. Finally, at 6:20 PM, I slowly poured the Salt Water from the South China Sea to the waves of the Pacific Ocen. Mission accomplished. I was able to finish this “West To East” Adventure Run. We tried to look for a place to rest overnight along Dingalan Beach but because it was dark along the main road that goes to the Beach Resorts, I decided to go back to Gabaldon’s Stone 8 Resort for the night. However, as we left the Poblacion of Dingalan, we dropped by a restaurant/resort on top of a mountain which is 3 kilometers away and along the highway. The establishment is called Gina’s Place. The place don’t have any display of cooked food but we were advised to order the food we want. I ordered Sinigang Na Yellow Fin Tuna and Broiled Blue Marlin. It was worth the wait as the tunas cooked were fresh. After our dinner, we were back to Stone 8 Resort. It is time to rest and recover. 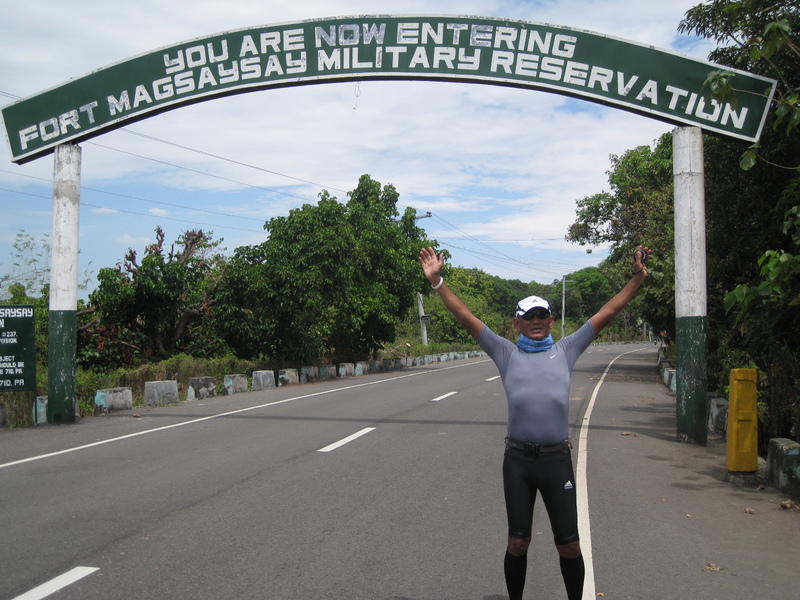 The last time that I passed along the Santa Rosa to Fort Magsayay Road was in the mid-part of 2004 when I was a Brigade Commander of the 702nd Infantry Brigade of the Philippine Army’s 7th Infantry Division with my Headquarters located in Barangay Calaanan, Bongabon, Nueva Ecija. The road was not yet paved/asphalted as most of it was a narrow dirt road. This road is the most direct route to Fort Magsaysay from the Maharlika Highway in Santa Rosa and I take this route as a short cut to avoid the traffic of vehicles in Cabanatuan City. 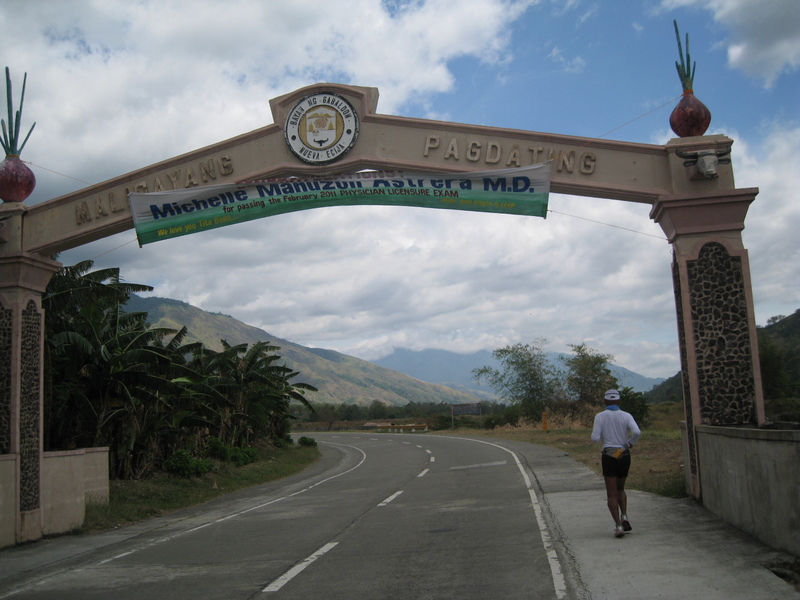 The road has a distance of 20 kilometers where both sides are open with rice fields and dry lands which were planted with mango trees as you approach to the military reservation of Fort Magsaysay. Fort Magsaysay is the biggest military camp in the country which consists of hundreds of thousands of hectares from the eastern portions of Santa Rosa, Nueva Ecija up to the seashore of the Pacific Ocean. The area is so vast that the military could not guard the reservation from informal settlers; kaingin farmers; and other kinds of squatters. Even if various types of military training are being conducted in these areas ranging from artillery fires, tank manuevers and combat fires, military exercises with other allied armed forces in Asia and the USA, and other kinds of special operations, those unscrupulous illegal settlers are still there to claim a portion of the military reservation. It is sad that the military reservation is now shrinking. When I was the Camp Commander of Camp Aguinaldo, I had a chance to play a round of golf with the Speaker of the House of the Representatives then and he asked me what is my solution for the unabated military adventurism of young officers to topple whoever is in power in the government. I told him that my idea is not a solution but it is a firm message that AFP Officers and Soldiers who are involved in this kind of military adventurism should be punished severely. I told the politician that it is about time to establish a State Penitentiary (outside Metro Manila) with a Military Prison Facility at the middle part of the Fort Magsaysay Reservation Area! And let these prisoners develop the area as homestead where they can produce and cultivate food and herd some domesticated animals and be away and out of reach from the media. The politician liked my idea and it ended there. 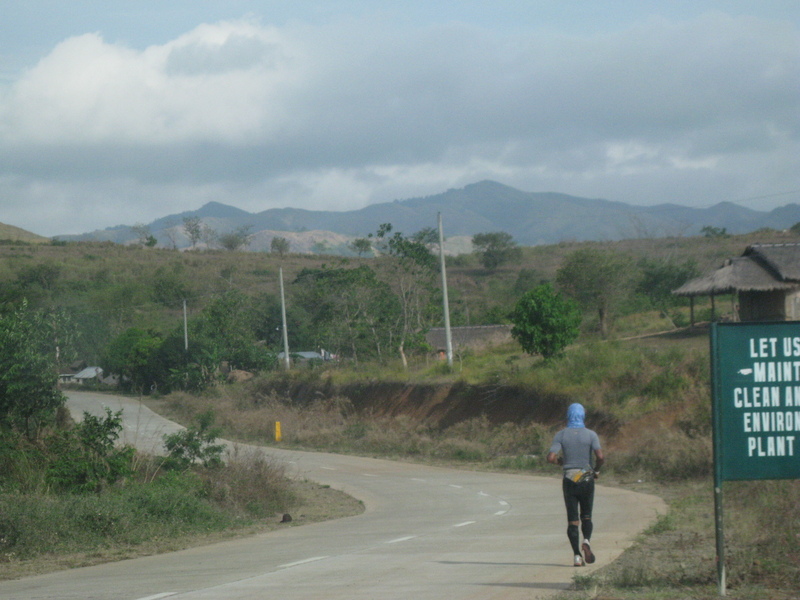 I expected that today’s run will be the most challenging stage due to the hotter temperature of Nueva Ecija and the looming hills/mountains that I am going to traverse as I progress towards my destination. I was informed by some of the officers assigned in Fort Magsaysay that there is already a short cut route from Fort Magsaysay that goes all the way to Laur, Nueva Ecija that traverses the mountains east of Fort Magsaysay. 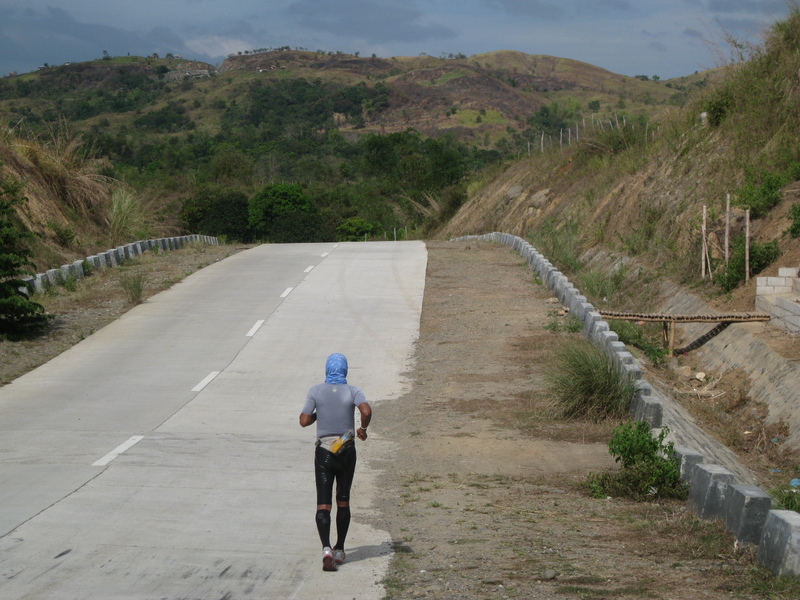 And the road has an estimated distance of 64 kilometers from Fort Magsaysay to the town of Dingalan, Aurora. 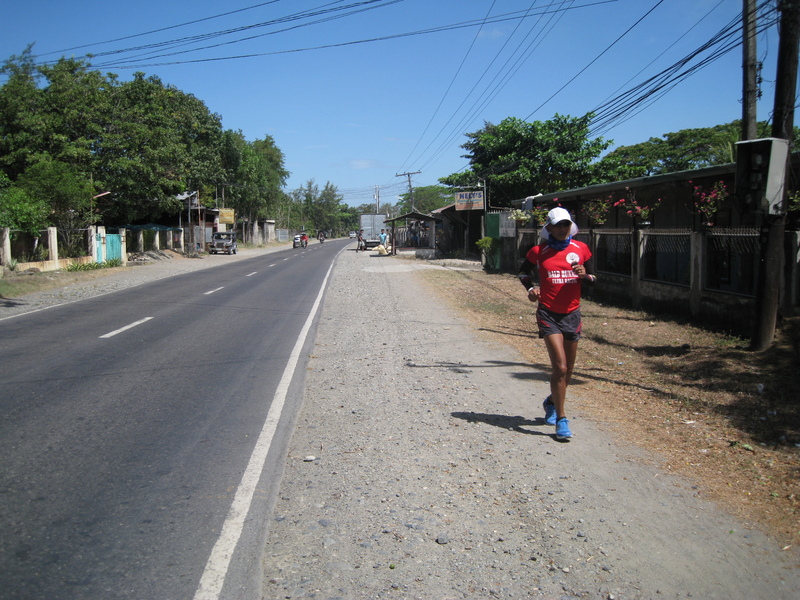 The flat, wide and hot road from Santa Rosa to Fort Magsaysay was already a challenge as I started my run at 10:30 AM. From where I started, I estimated that I still have at least 81 Kilometers to my destination and covering one-half of the distance was already enough for my day’s run. I started my run from where I stopped the previous night. I was still using the Adidas Tech Fit Compression Shorts and with my Gray NIKE Compression Shirt. I decided not to use my arm sleeves as I would like to see my perspiration simply dry up from my skin while I was running. I prepared for my Ice Bandana to cool off my neck and nape and my Buff to cover my face. The ritual for hydration was still there and my strategy for my pacing but every time that I have my pit stop, I have to pour cold water on my head making my running cap wet/damp while running. This was the first time that I did such ritual of pouring cold water on my head and nape every time I take a sip of water from my support vehicle. Since I did not bring sponge, this ritual gave me a refresh feeling every two kilometers. The pain on my knee/left quads was tolerable and I have to make some adjustments with my footwork. The ASICS Gel- LyteRacer DS was very nice and comfortable to my feet as they are light with the much-needed cushion. I decided to use this shoe throughout the run after my bad experience with my Adidas Adizero Mana on my 4th day leg. 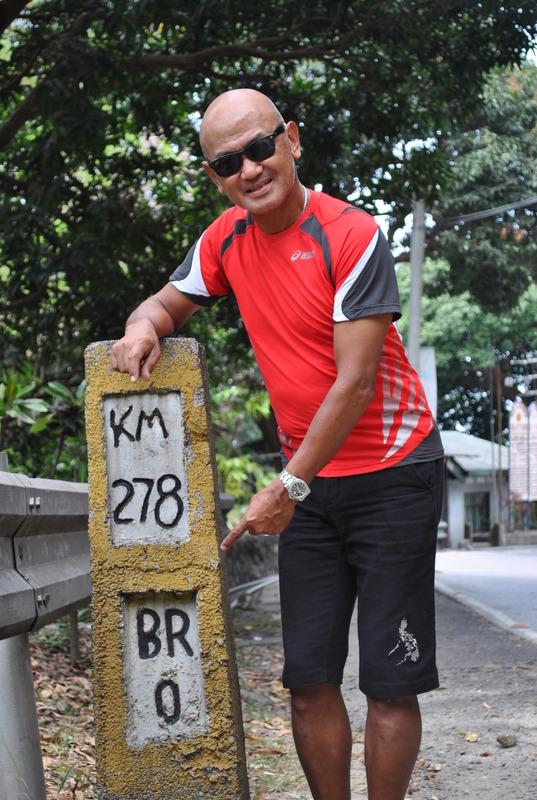 As I got nearer to the boundary of the Fort Magsaysay reservation, the road started to ascend but I knew it was runable but I opted to conserve my strength by brisk walking through the uphills and resume running on the downhill parts. As I reached the intersection of the road that goes to the Gate 1 (Main Gate) of Fort Magsaysay, trucks that carry US Armed Forces mobility assets and other equipment were still passing me and saw them entering the premises of the camp. I concluded that with the volume and number of trucks that passed me for the past two days, this military exercise would be involving a lot of troops and administrative personnel! The Last Wide Truck To Pass Me & Approaching A New Crossroad! 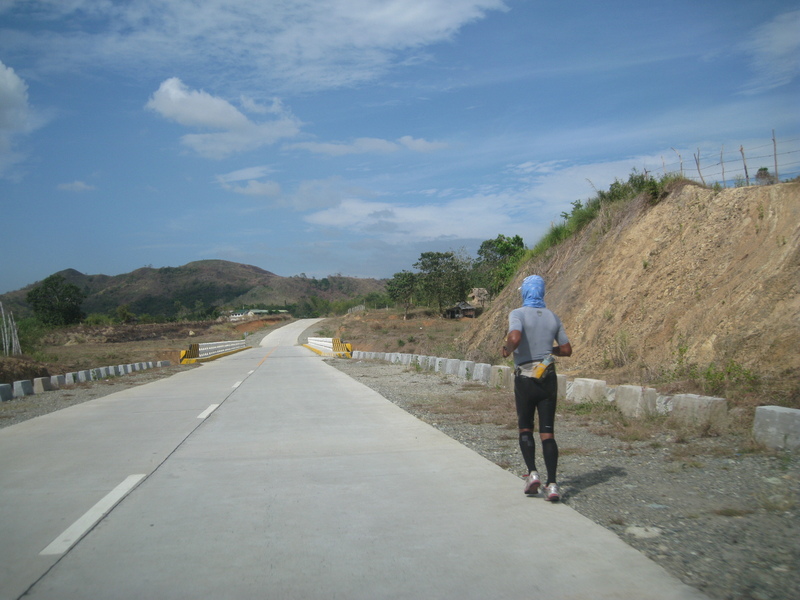 As I crossed the Bangad-Fort Magsaysay Road, I could see in front of me a newly constructed and newly-opened highway that goes way up to the mountains of Fort Magsaysay. The peak that I am going to reach was still vivid in my mind. It was the same “impact area” or location of our target when our basic infantry class had our hands-on firing of the 105-mm Howitzer Artillery pieces. Yes, those were the days when we were trained to request for an artillery fires by following some “structured” steps so that the one who is adjusting and pulling the trigger of the artillery piece would be able to land the artillery ammunition/rounds accurately to where the target is. After running at least 3 kilometers from the crossing/entrance of this new highway, I dropped by a roadside eatery, the only eatery before going up the peak of the mountain. It’s called Big Joe’s Eatery and I immediately asked for the viand available for lunch. They have Sinampalokan Na Manok which was the viand with a soup/broth for the day and I ordered two orders. The taste of a home-coke viand is heaven, moreso, if you are running a multi-day stage run! They simply call the place “Tanawan” which is the common name they give to a place at the foot or mid-part of a mountain as you go to the peak. While I was eating, a white Lexus Car stopped at the place and the occupants also took their lunch thereat! What? These people could be locals, I thought. But when they were finished with their lunch, they asked how far is Santa Rosa is from the place. A-ha! They are also first-timers like me on this road! Started Running Again After Lunch...The Mountain Pass Is On The Left Side of the Mountain! The road leading to the peak of the mountain was very challenging and the temperature of the day was so hot that I have to be supported every 500 meters. Definitely, this is the hardest leg of my adventure run. If the ascending portions are very challenging, the descending parts are much more challenging. I have to control my footsteps on the steep descending portions as I don’t want more pain and swelling of my left quads and knee. I took light and short strides on these downhill portions as I was careful with any untoward incident or issues on my leg muscles. I don’t want to do any foolish thing that may cause any untoward accident to happen with barely 50 kilometers away from my destination as I wanted to finish this adventure run. It could be funny to see me running on those descending portions as I could visualize myself to be running very erect with my back straight up as I control my footsteps/stride. I admit I walked on those steep ascending portions of the route that leads to the peak of the mountain. Sometimes, I tried to walk backwards just to relieve the pressure on my quads and knees as my calf muscles are the ones that are working and being stretched. There was no point on attempting to jog along these parts of the road. I feel much comfort that I was able to see a military detachment on top of the mountain where you can see Cabanatuan City on the west and the Sierra Madre Mountains on the east. Aside from providing security in the area, the military is also reforesting the place with young trees. There is also a road side eatery where food and refreshments are available and I could see some Nipa Huts which you could rent for P 50.00 per hour to enjoy the view of the place! 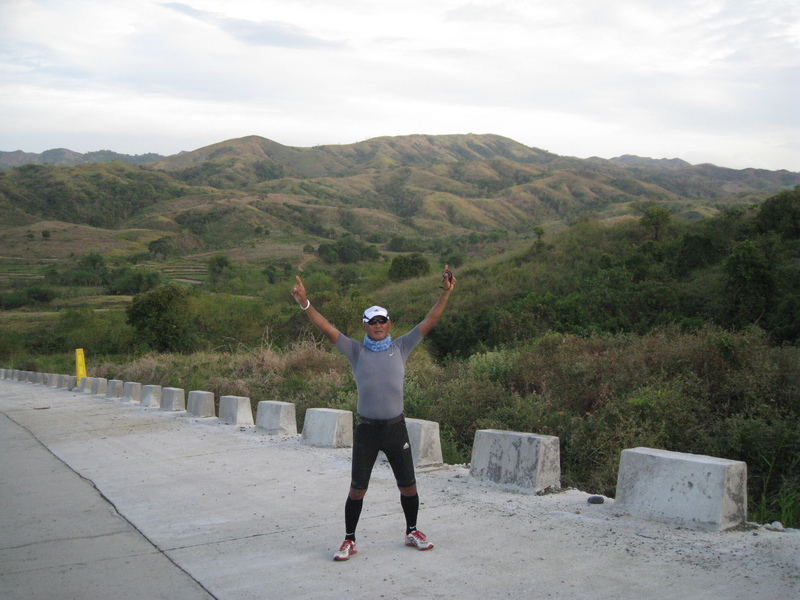 As I passed the peak of the mountain, I knew it will be a roller-coaster run/jog/walk up to the crossing on the old road/highway that goes to the small town of Laur, Nueva Ecija. The eastern side of the mountain is more developed and more populated as I could see some mango orchards and cultivated fields on the side of the mountain. There are also groups of houses (they call itself as “puroks”) which I assume are also illegal settlers. But most of all, I really wonder who owns those mango orchards whose trees are already bearing fruits that nearly touch the ground. I hope these mango orchards are under the administration of the military units stationed in Fort Magsaysay! What??? Another higher peak hidden? My Reward For Reaching The Top of the Mountain! I told to myself that I have to reach the crossing towards Laur before it becomes dark. 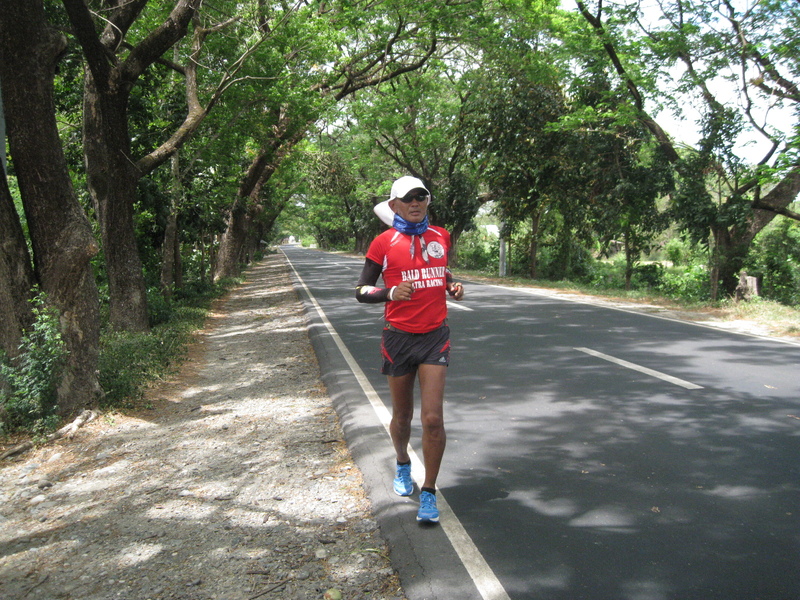 With consistent pacing and following my hydration and nutrition strategy, I could see already in a distance the vehicles that are travelling along the Laur-Gabaldon Road and it gave me the satisfaction that I still have one more day to go before I finally reach my destination. Another "Marin Headlands" Version In Laur, NE? Tired & Exhausted But Still Having Fun! 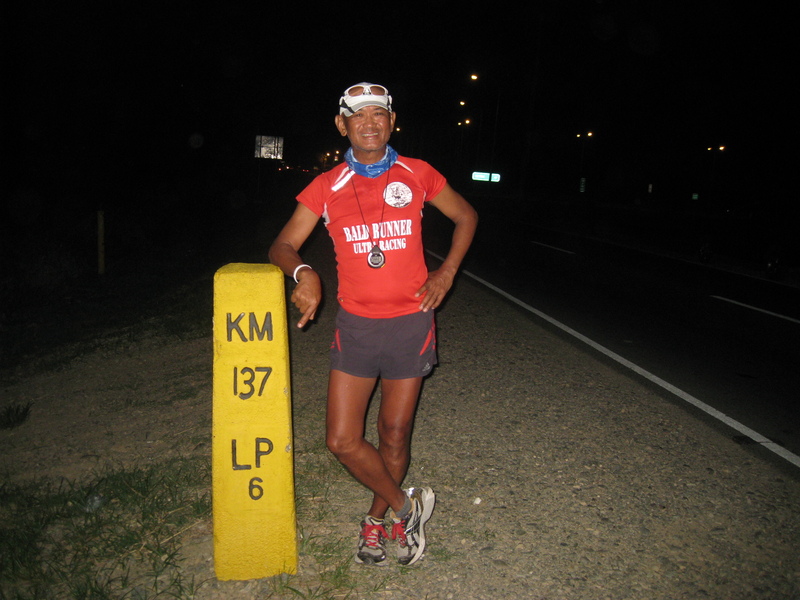 As soon as I reached the crossing, I found out that I was able to cover a distance of 41 Kilometers since I started my run from Santa Rosa but I wanted to reach the Km Post 0 that is located in the Poblacion of Laur. 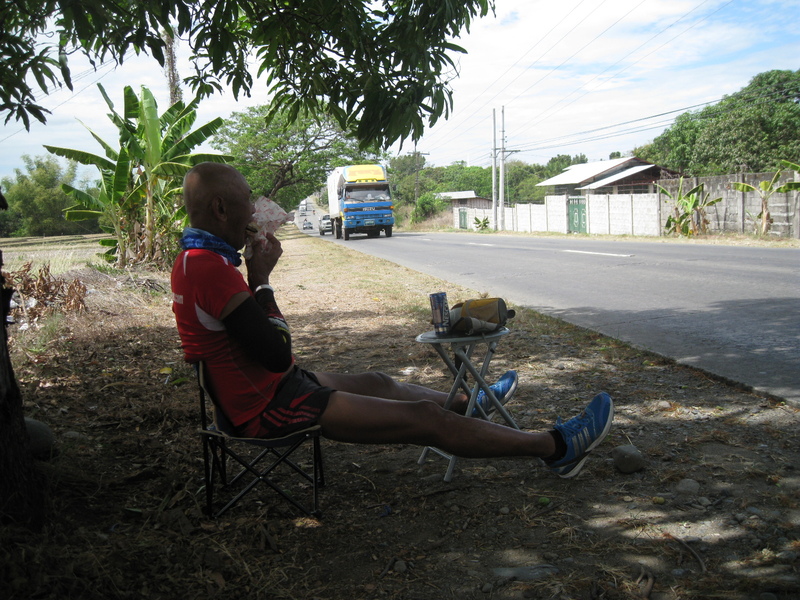 I instructed my support crew that I have to complete at least 42 kilometers and I need one more kilometer to run. 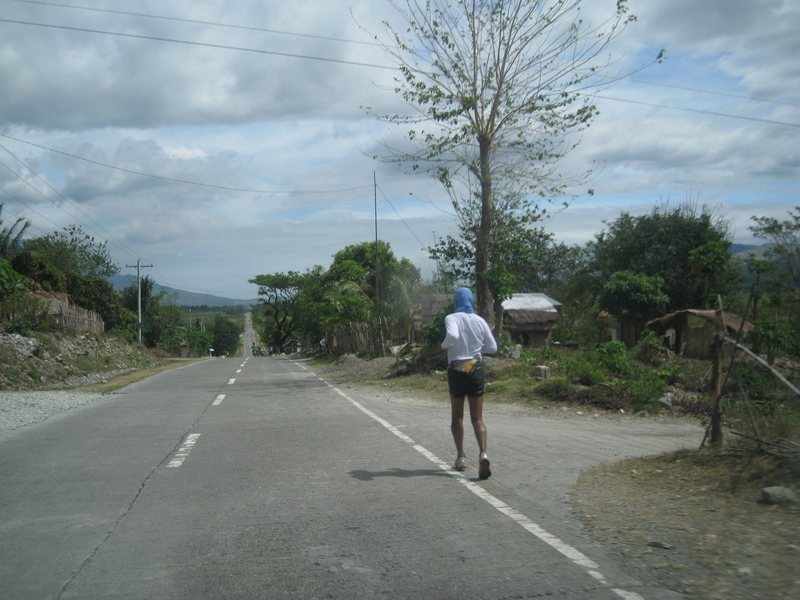 So, while I was running along the Laur-Gabaldon Road, in a few meters, I saw a Km Post that says that there are 4 kilometers more to go before reaching the town of Laur. I decided to continue my run with my support vehicle providing me with the illumination I needed. The road was not busy and it was already dark. I comfortably maintained my strides with the objective of reaching Laur and be able to run a distance of 45 kilometers for the day. As we got nearer to Km Post 0, we were able to pass by a store that serves hot mami and I decided to stop and take some hot noodle soup. We actually want to ask some information from the locals about the nearest resort where we can stay overnight and the store was the best place where we can inquire about such information. As we were eating our noodle soup, I started the conversation with the owner and after some exchange of questions and answers, we decided to take a look at the said resort that the owner of the store had recommended. 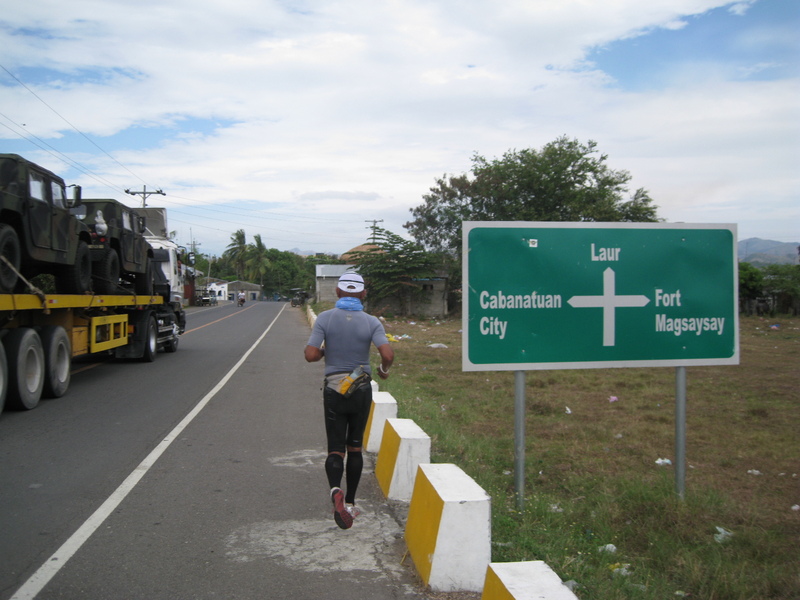 However, I still need to run and reach Km Post 0 of Laur, Nueva Ecija. I was surprised that the Km Post is only 150 meters away from the Store! I stopped my run officially for the day on the said Km Post. I need to rest but the place where we are going to check-in for the night is still 18 kilometers away towards Gabaldon. It took us only few minutes to reach the place aboard our support vehicle. Although the place is not well lighted, we did not mind as we need a place where we can take a shower, wash some clothes, and sleep overnight. Unfortunately, there is no Wi-Fi Connection! However, I am sure that once there will be sunlight the following morning, the place will emerge as a beautiful place to rest and stay! Last Kilometer Post For The Day...36-37K To Go! 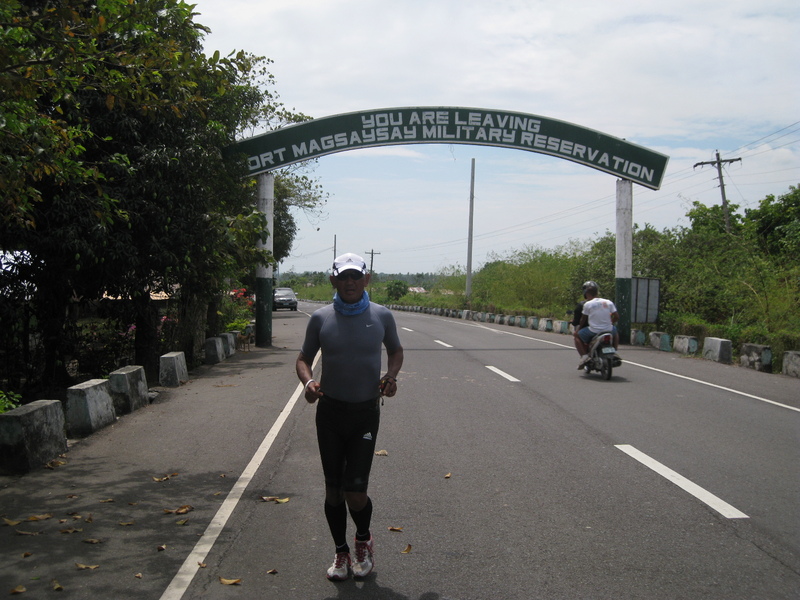 I was able to cover a distance of 45 Kilometers from the Starting Point in Santa Rosa up to Laur, Nueva Ecija. 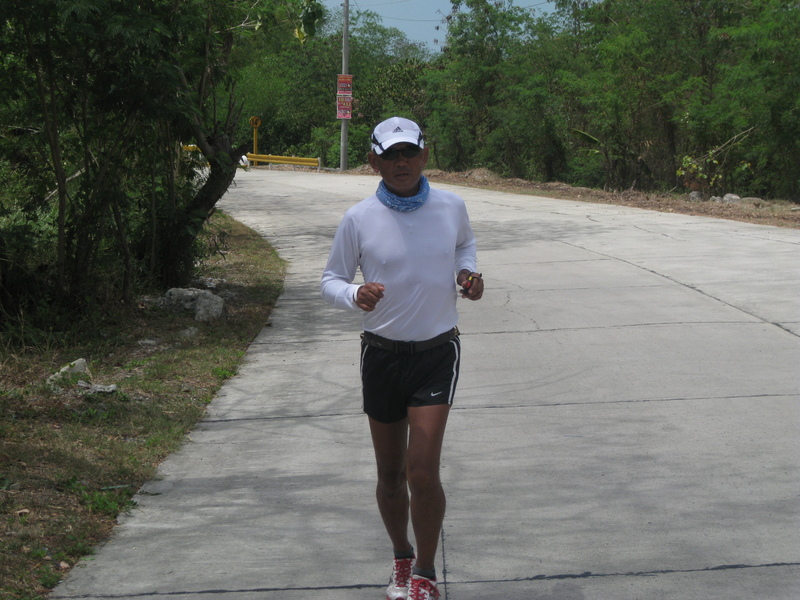 This leg is the hardest day in my adventure run due to the hot temperature in Fort Magsaysay and its immediate environs and the challenge of the steep inclines going to the mountain pass. The steep descending portions were also a challenge on my part because of my swollen quads but I was comforted with the nice scenery that my eyes could see all around me. These places and scenery are priceless! We stayed overnight in a resort which is called Stone 8 Resort which 5 kilometers away from the Poblacion of Gabaldon, Nueva Ecija. Weather: Very, very hot along the Santa Rosa-Fort Magsaysay-Mountain Pass Road. “West To East”: 4th Day/Swollen Quads! I was able to sleep for 9 hours at the Royal Blue Hotel in Camiling, Tarlac and it was really a sound sleep. 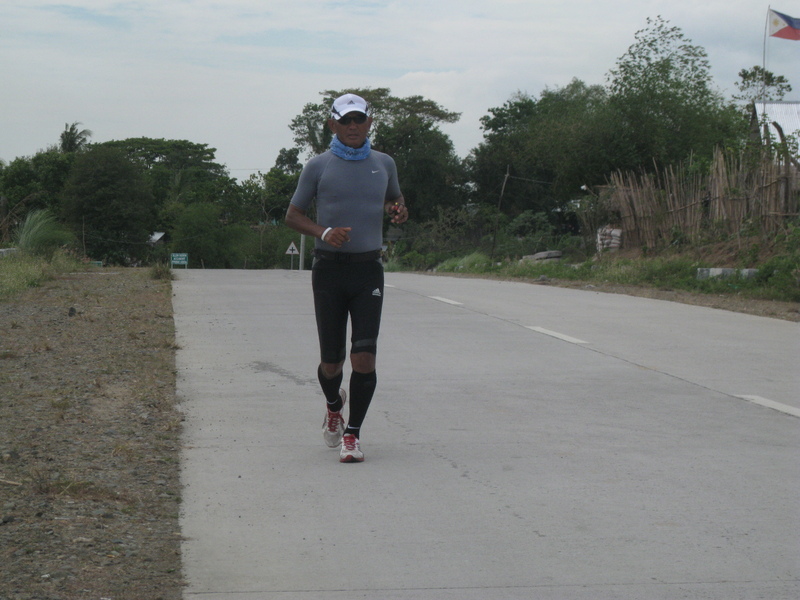 I felt energized again for the day’s run from Camiling, Tarlac up to the Kilometer Post where I could decide to stop to end the day’s run. The plan was to run leisurely without thinking of the number of kilometers that I have to finish for the day. I also started not to follow the Galloway Ratio of Run-Walk. I just simply ran an average pace of 7:30 to 8:00 minutes per kilometer and take a brief walk few meters before reaching my support vehicle. However, I maintained my ritual of walking the uphills and running through the downhills. 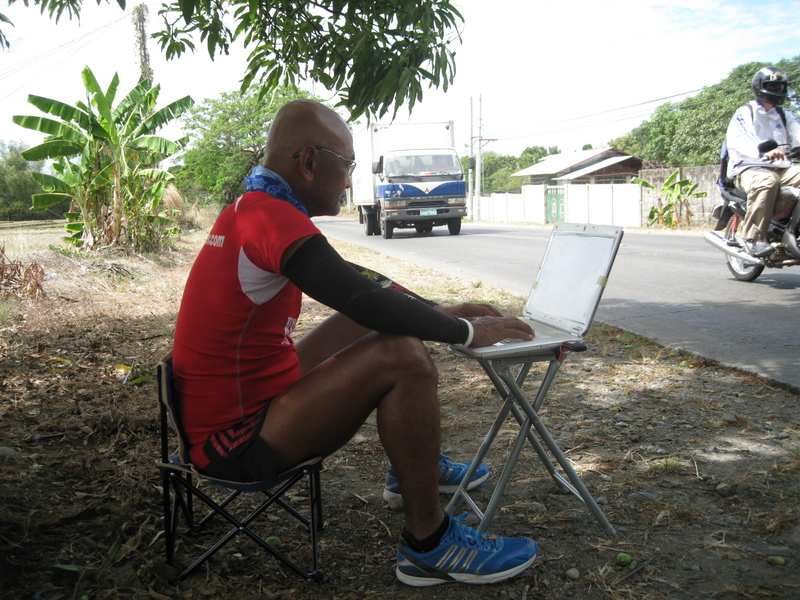 My brief pit stops would last from 2-4 minutes and checking my blog through my laptop would last up to 15 minutes. And eating in those carinderias/road side eateries would last me for a stop/rest of 20 minutes! After the usual “drill” upon waking up from bed, my team was ready leave the hotel for a brief breakfast at Jollibee. 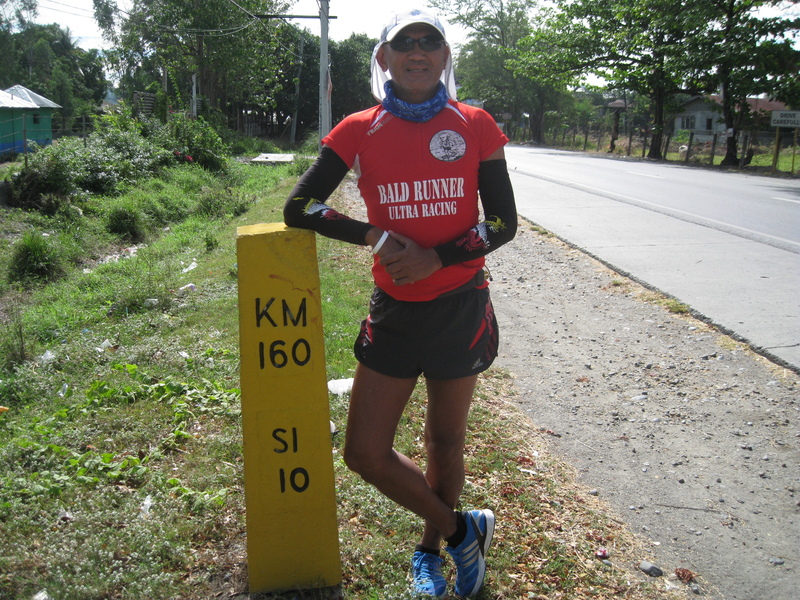 After breakfast, I was brought to the last kilometer post where stopped the previous night for the regular photo-ops as a part of the starting regimen of every daily run. I started my run at 9:45 AM. 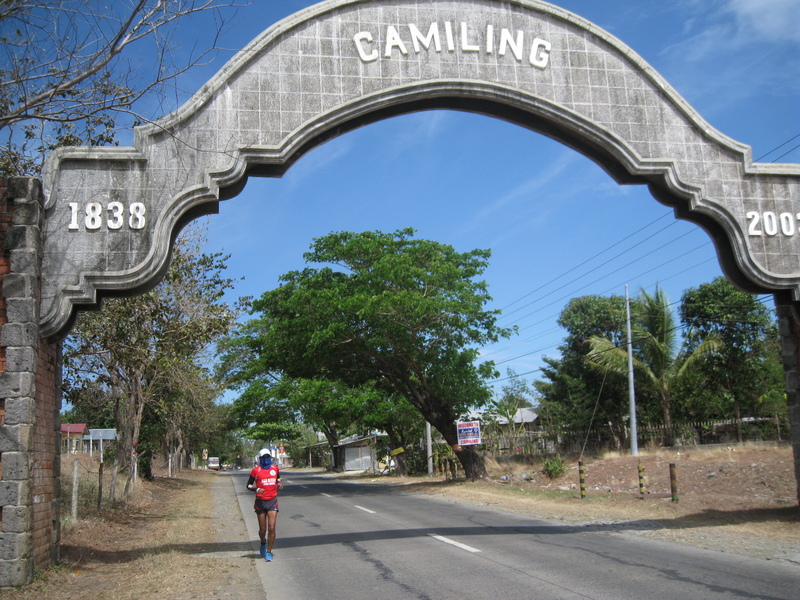 It seems that Camiling, Tarlac is the “melting” pot of the western portion of Tarlac Province. Once you pass along the commercial district of the town, you could see the slow movement of vehicles due to traffic. There was a parade of vehicles advertising some sort of Hog’s Feeds and a new business establishment for farm needs and supplies. It is also the crossroad of vehicles going to the central towns of Pangasinan and the western towns, too! So, vehicles and mass transport/buses coming from Manila and from the Western & Central Pangasinan would converge in this town. Due to the heavy traffic of the main road, I had to walk for about 2 kilometers on the sidewalk trying to observe the people, the vehicles, and the environment. It is good to see 2 PNP personnel manning the crucial intersection to see to it that the traffic is done in orderly manner. All the vehicles are moving but with a crawling speed, at least, all the vehicles are moving. 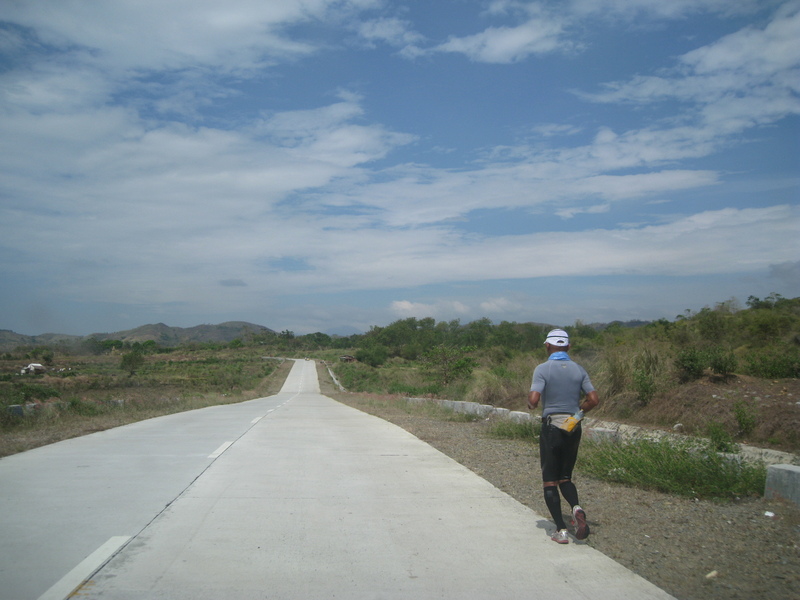 After two kilometers of walking and another right turn towards Tarlac City, I started my jog as I met a lot of vehicles coming from the opposite direction. The usual ritual during the previous run was followed—drink water every 2 kilometers where my support have advanced; drink sports drinks every 1 ½ hours; and eat solid food during my longer duration of pit stops. Just like in the previous days, I see to it that I have to urinate at least every hour and observe how my body is perspiring. Since yesterday, I opted not to take any Tylenol tablets to ease the pain on my running legs. 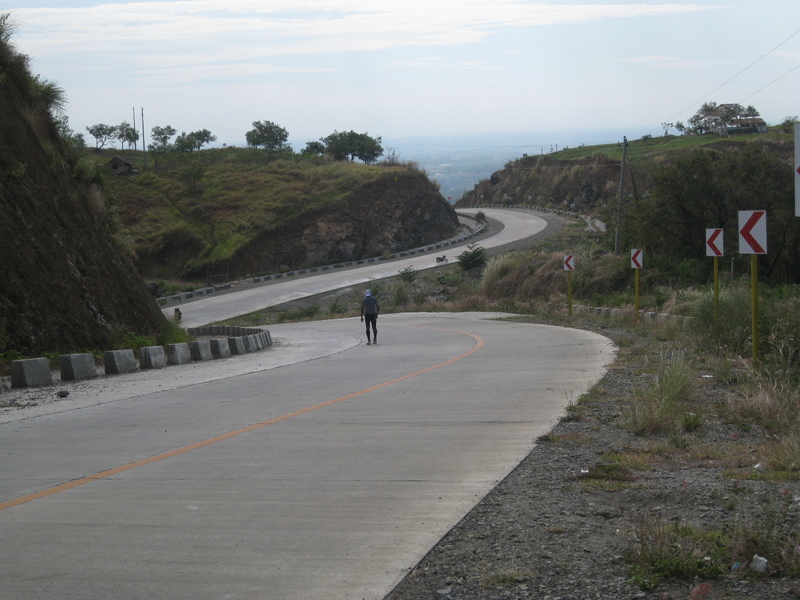 The road from Camiling to Sta Ignacia, the next town, and towards Tarlac City is famous for those rolling and long ascending and descending slopes that I have to force myself to walk on those ascending portions and run through the descending parts. It was a repetitive process to be doing this to preserve the strength of my leg muscles. On those walking breaks on the ascending portions, I would also count my strides just to be able to have a continuous rhythm and pace throughout those inclined portion. Although I was still on the right side of the road, I would go to the shoulders when I have my walking breaks. 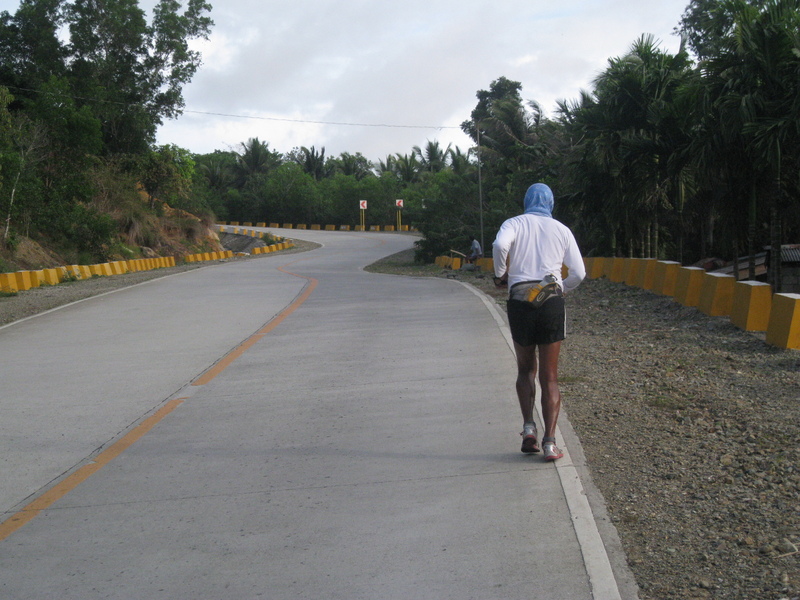 But on those descending parts of the road, I have to continue my running on the paved portion of the road. If there is white-line paint on the edge of the road, then this is the place where I have to land my foot during running. Those white lines are surprisingly rubberized that it has some bounce on my running shoes. There were lots of ascending and descending parts of the road for today’s run. Running Alone On The Road...Again! The student is smart and he has a point! After that conversation, I was already thinking of stopping my adventure run and go home to have my rest. But as a “warrior” I don’t want to be distracted in accomplishing the mission that I have set to myself. 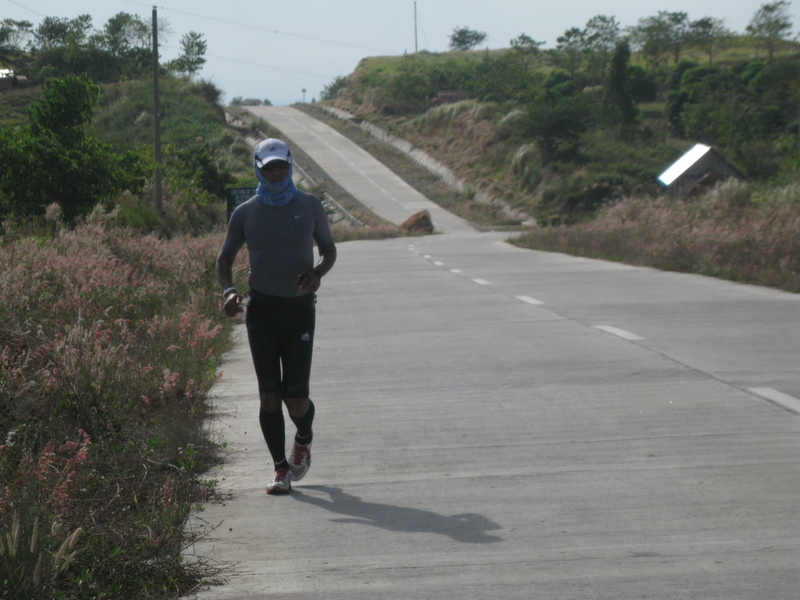 I resumed my run and running and walking through the ascending and descending portions of the road that leads to Tarlac City. 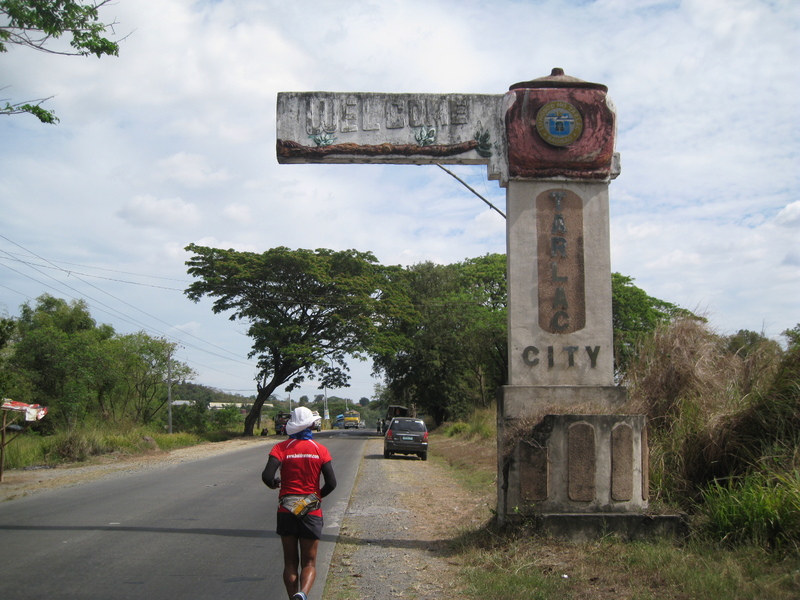 Later, I was already entering the city limits of Tarlac. 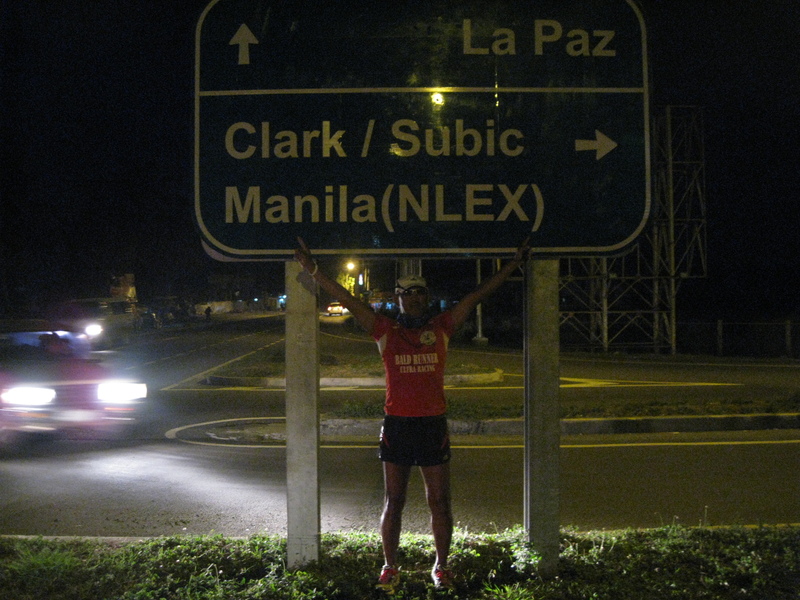 The Aquino Bridge is the target to cross and I am already within the Commercial Center of Tarlac City! But something is bothering me on my feet. It seems that my feet are burning and I could feel that they are getting hot and had expanded. 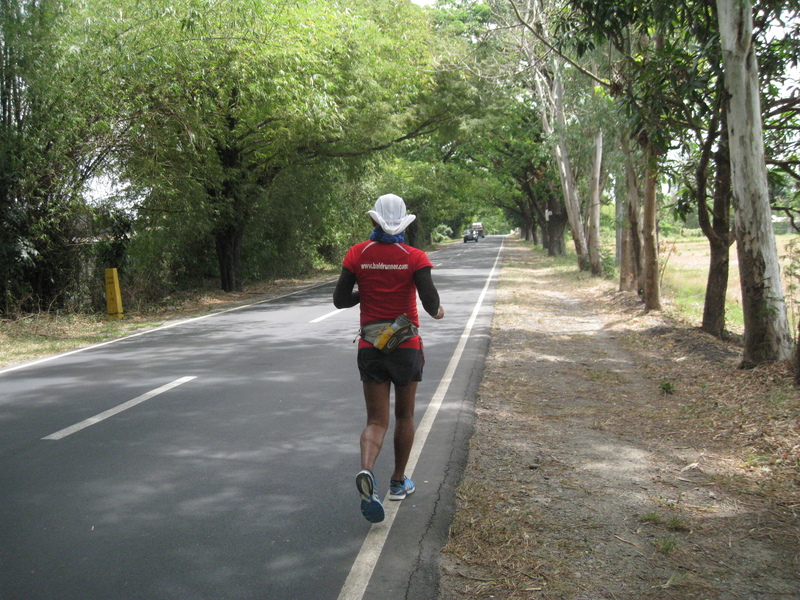 With one kilometer to go before the Aquino Bridge, I decided to stop by my support vehicle and changed my socks and running shoes. I opted to use the Adidas Adizero Mana for the day but it was my first time to feel such burning sensation and expansion of my feet after running with it for about 32 kilometers. I was using my ASICS running socks which I’ve been using for my long runs but I knew it was the shoes that was causing the problem. I immediately changed my socks with the local PUMA running socks which are thicker and used the always reliable stability-cushion properties of my ASICS Gel-Kayano 14 shoes. After changing my shoes and socks, I was back on the road, crossing the Aquino Bridge, walking along the commercial district of Tarlac City and later I was already entering the road that goes to La Paz, Tarlac and to the SCETX Entry/Exit. As I was running along the La Paz-Sta Rosa Road, I felt I was hungry and decided to stop in one of the Carinderia/Turo-Turo Eateries. I ate a big bowl of Bulalo Mami/Noodle Soup with Ice Cold Coke. The simple meal energized me and I resumed my running. It was already getting dark and the main task at hand was to reach the SCTEX entry/exit where I’ve decided to end the day’s run. I think I walked on the last 3 kilometers because of the heavy traffic on the said road, the dark sidewalk, and most of all, those gravel filled sidewalk where the foot hurts when I step on those big and small stones! Finally, I reached my target, SCETX! 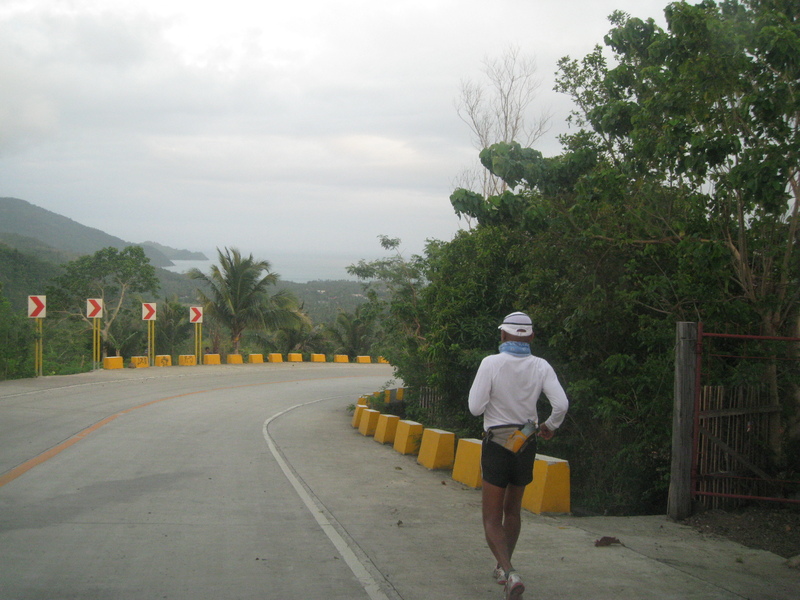 At this point, I was already thinking of ending the adventure run and head towards Metro Manila. 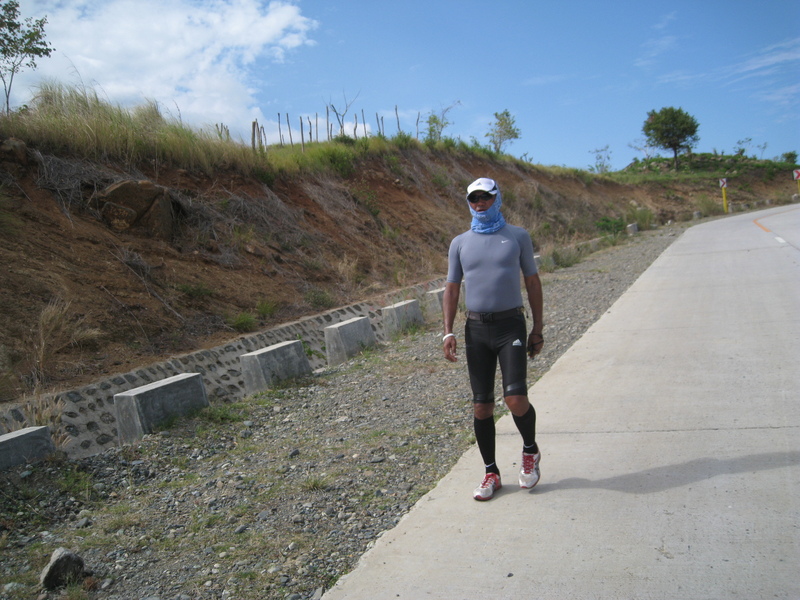 For today’s run, I was able to cover a distance of 45 Kilometers and in a Total of 175 kilometers in 4 days. I could feel that there was some pain on the mid foot portion of my left foot and my left knee was also in pain. After changing to drier clothes, I decided to look for a place where we could sleep with a Wi-Fi connection and I was back on my mission. After eating my dinner, checking in a cheap hotel with Wi-Fi Connection in Cabanatuan City, and taking a shower, I observed that the lower portion of my left quadriceps had swollen. I thought it was my left knee that expanded in size but as I compared it with my right leg, I could see and feel that it was my lower left portion of my quads (it connects to the knee) that have been bloated and had some pain when it is pressed by the thumb. It was my first time to experience this and I knew that I got it from those descending roads in Sta Ignacia and Tarlac City. I would say this is the description of ultra trail runners of what they call as “fried quads”. There is no panic! I told my support crew, Marlon, to put some ice in my ice bag and have it strapped on the swollen part of my quads and then to massage it lightly with Omega Pain Killer. And lastly, to remind me to take one Alaxan FR capsule before I go to sleep. After 9-10 hours of sleep, the swollen quads had reduced its size and there was no more pain that I could feel on my quads. It’s a “Go” again for the 5th Day! Weather: Still hot but there are some places that were shaded with trees.